After our trip, I decided to ask all the members of the family about their favorite parts of the trip. I thought it might be a fun way to close out the recap of the trip. So, here they are, in their own words. 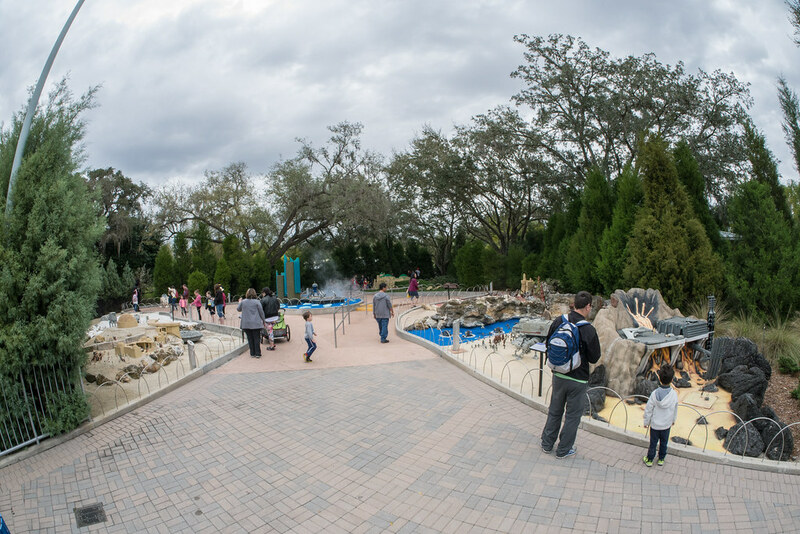 Which park was your favorite? What were your 3 favorite activities of the trip? What was your favorite thing on each day? Molly - Coastersaurus. My favorite part was at the place where they take your picture. My least favorite part was when there’s the two big drops. Cinderella’s Castle - cause the chicken nuggets were so good. 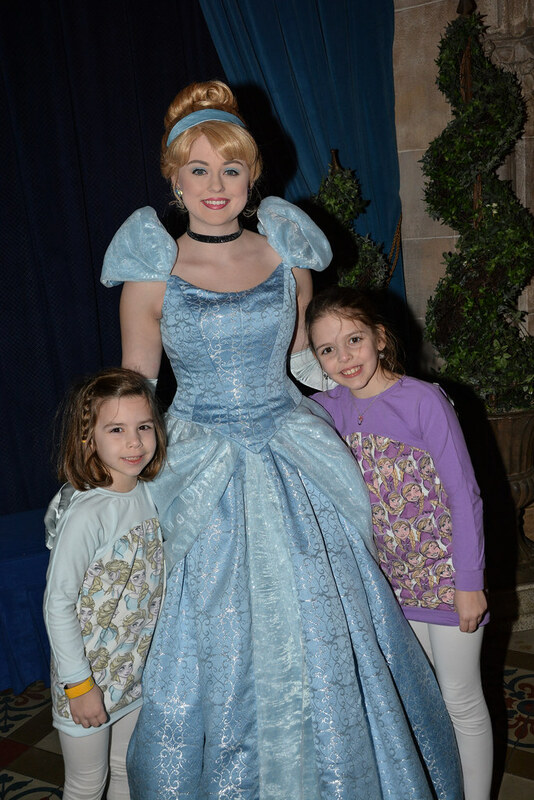 And also cause you got to meet princesses. And Sanaa, where you got to make your own cookie, and cause I got to see zebras, and cause the pizza was so good. The girls are already asking when we can go again. 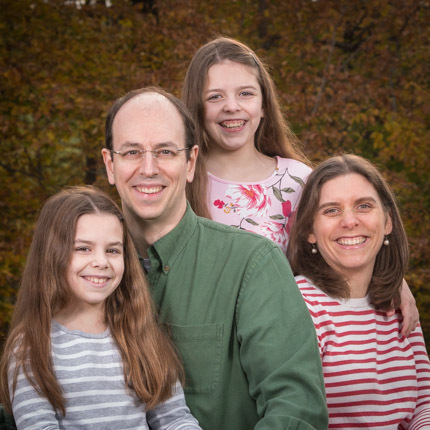 I told them that next time, I want to go to Universal Studios so we can go to Harry Potter World, but we shouldn’t do that until Leah had read at least the first couple of books. So, as soon as she does that, we’ll start planning a trip. Maybe it’ll give her some motivation to work on her reading skills in the mean time. When we started planning our Orlando trip, we thought Monday would be a travel day. But when we looked at flights, we realized we could fly back late enough to give us a half day at the parks. 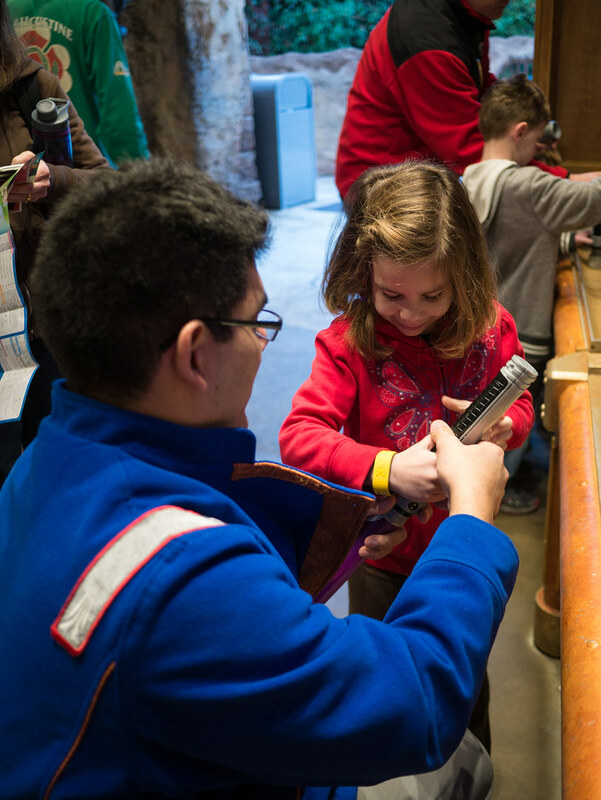 Adding an extra day to our park tickets was quite cheap (adding extra days gets progressively cheaper). 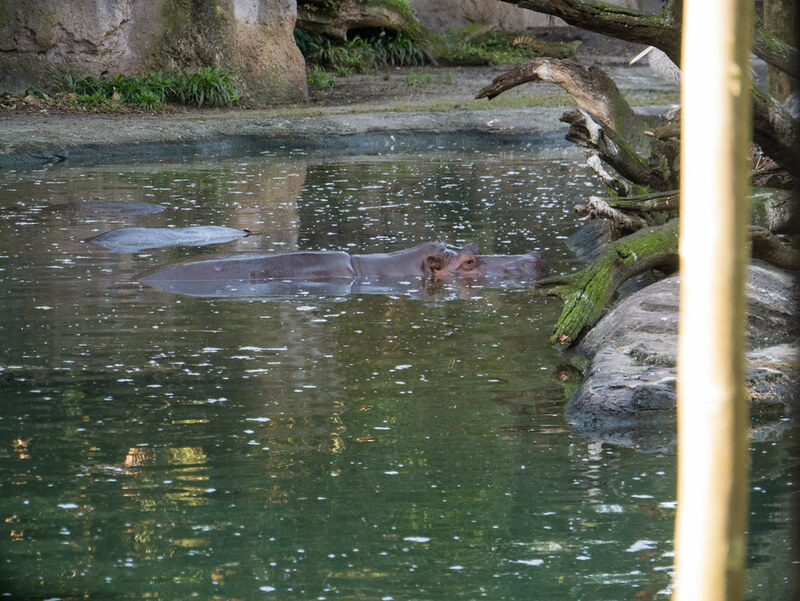 So, we decided to add a half day of Animal Kingdom to our trip to maximize the fun. We woke up early, got ready, and packed up. We headed down and checked our bags for our flight at our hotel (yes, the resort no only printed our boarding passes and delivered them to our room, but also let us check our bags for our flight at the hotel). We got Luggage Services to hang onto the girls’ backpacks so they didn’t have to keep up with them at the park. Then we hopped on the bus to Animal Kingdom. 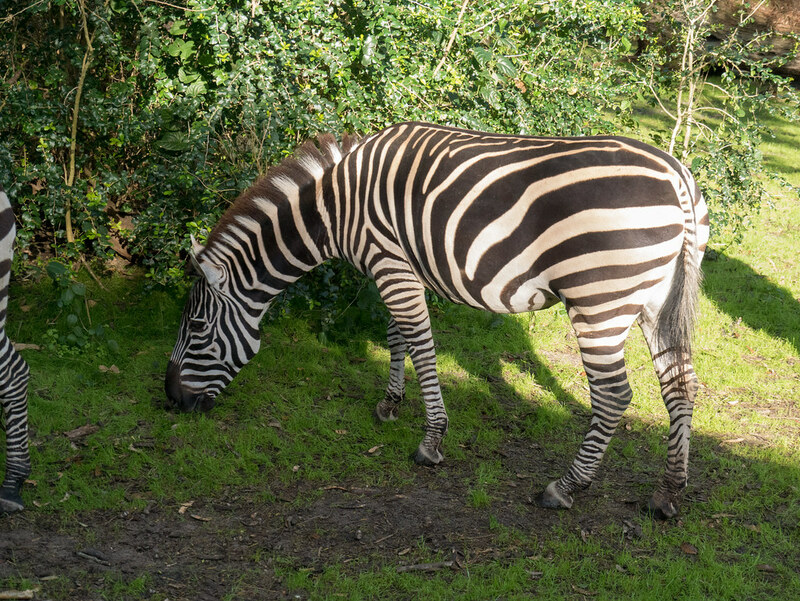 and zebras so close you could almost touch them. 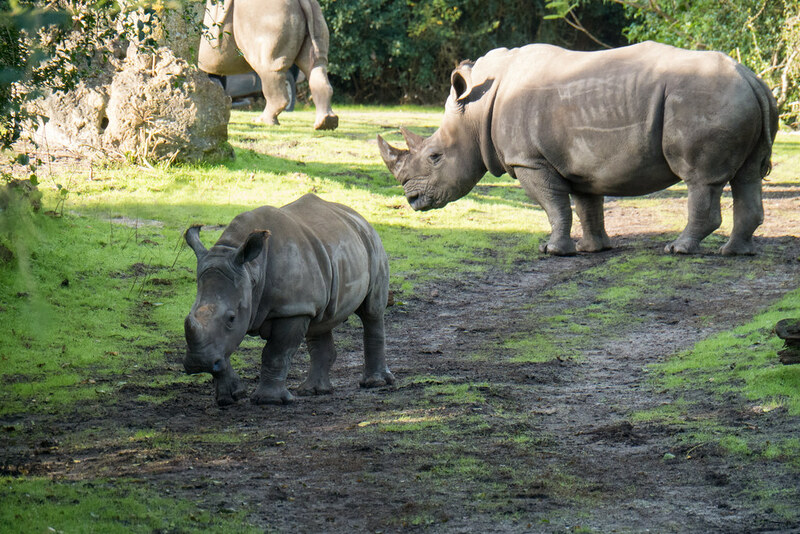 It was really cool - definitely my favorite attraction at Animal Kingdom. 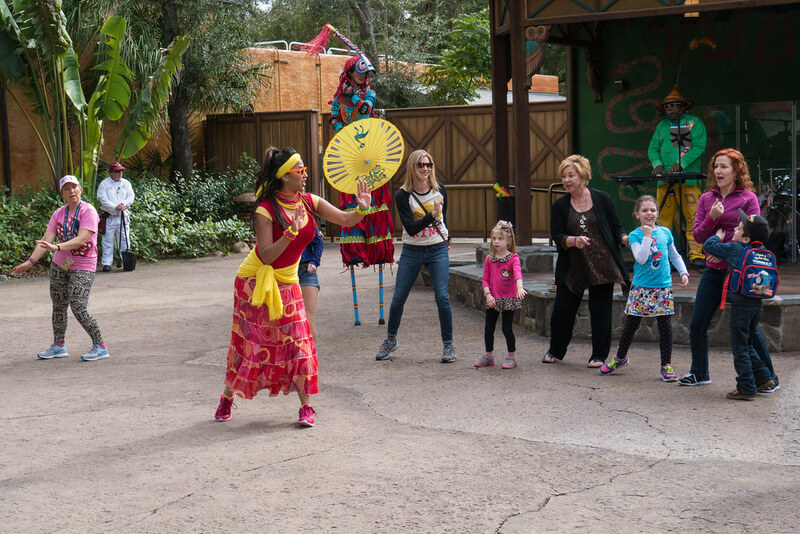 When we got out, we stumbled upon the Tam Tam Drummers of Harambe and got to listen to some drumming. This was a nice source of entertainment while we waited for the Lion King show to open. 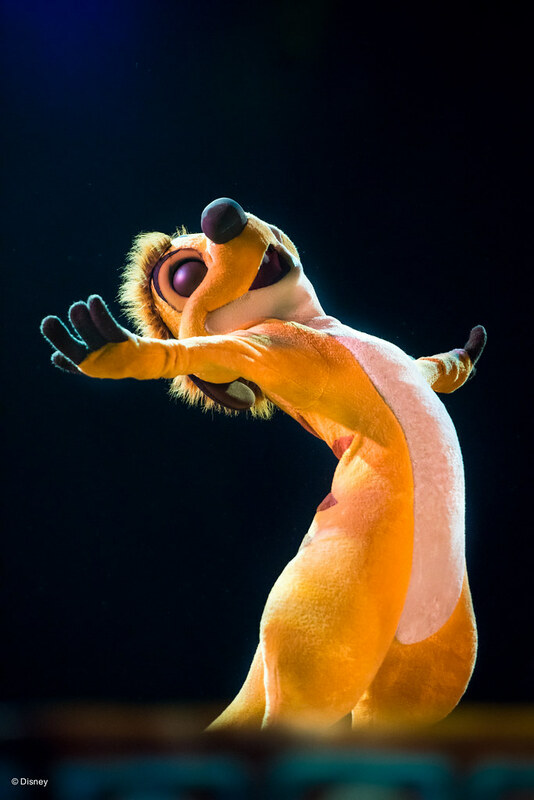 Then, we headed to the Festival of the Lion King. It’s a huge live show with singers, giant puppet animals, dancers, gymnasts, fire jugglers, and more. 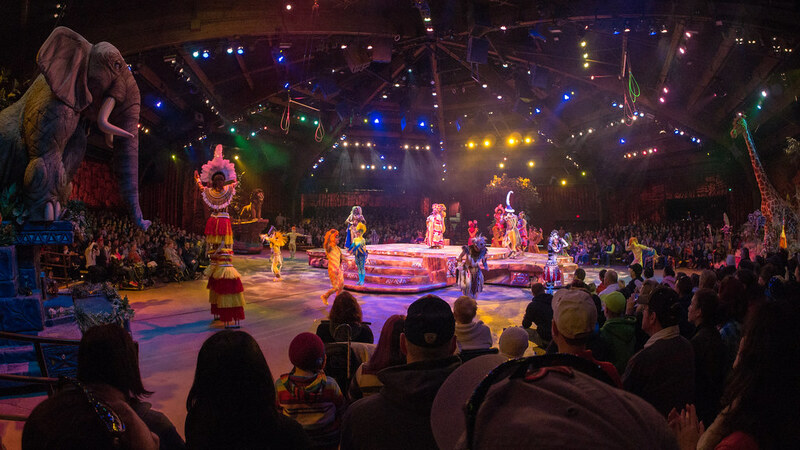 The audience sits on four sides of the performance, each representing an animal (go giraffes!). Next, we thought we might check out the Tree of Life before lunch. Sadly, it was closed that day, so that didn’t work out. 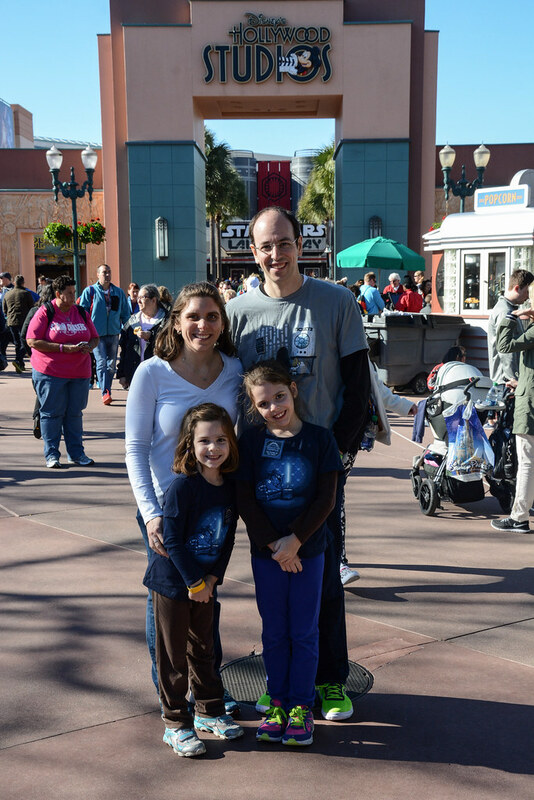 So, instead we took a family picture at the front of the park before heading to lunch. We were shocked at who we saw there. We couldn’t have a fancy dinner since we’d be on a plane, so we instead had a fancy lunch. 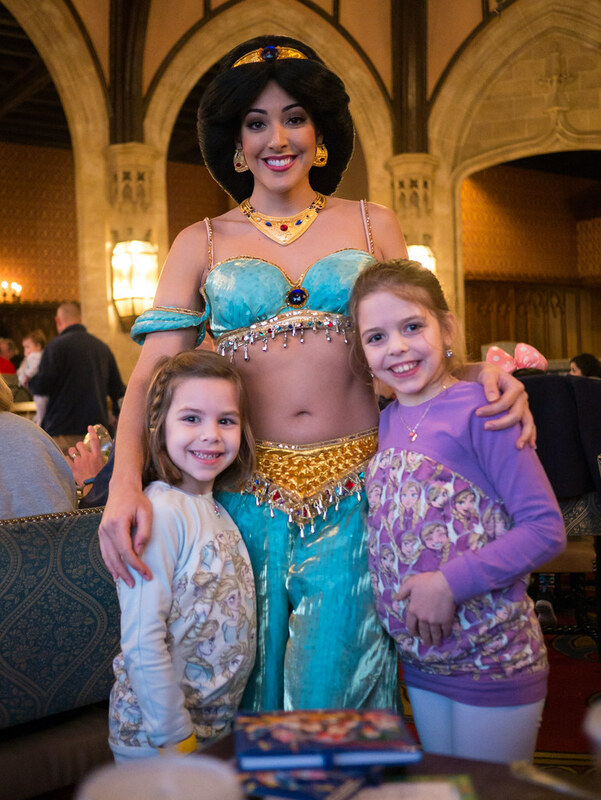 We heard that Sanaa, the restaurant at the Animal Kingdom Villas was very cool (thanks Kelly), so we went there. To get there, we had to leave the park and take a 5 minute bus ride to the villas, but it was definitely worth it. Sanaa was delicious African cooking with Indian flavors. We definitely recommend getting the Indian-style Bread Service appetizer. Jen had the Tandoori chicken and I had the Potjie Inspired (braised beef and seafood curry), and they were great. Easily the best meal we ate at Disney. And not only was the food great, the atmosphere was very cool. It’s a fancy restaurant in a fancy hotel, but right outside the window next to our table is a wildlife reserve. 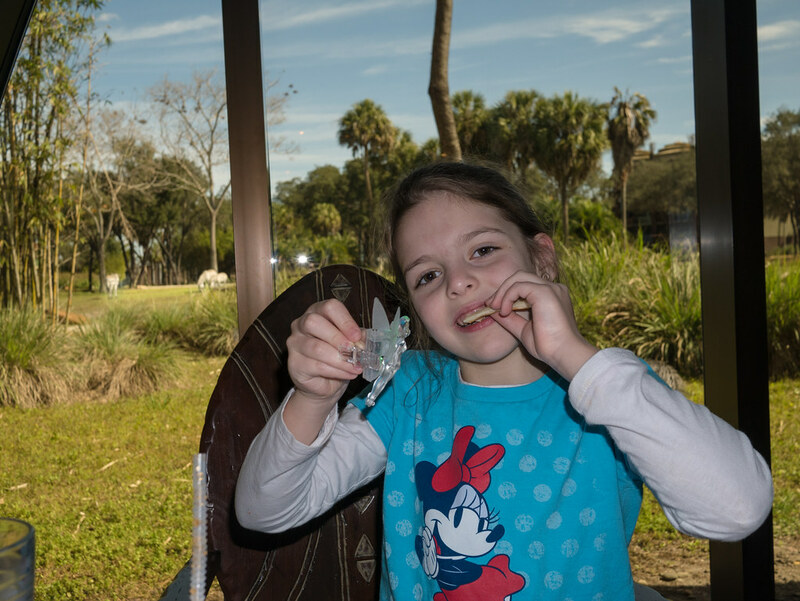 This may not be the best picture of Molly eating her naan and showing off the light-up Tinker Bell that came on her drink, but the awesome part is the zebras in the background. Yes, there were zebras outside the restaurant, as well as a bunch of large birds. There are apparently often giraffes as well, but they weren’t around during our meal. 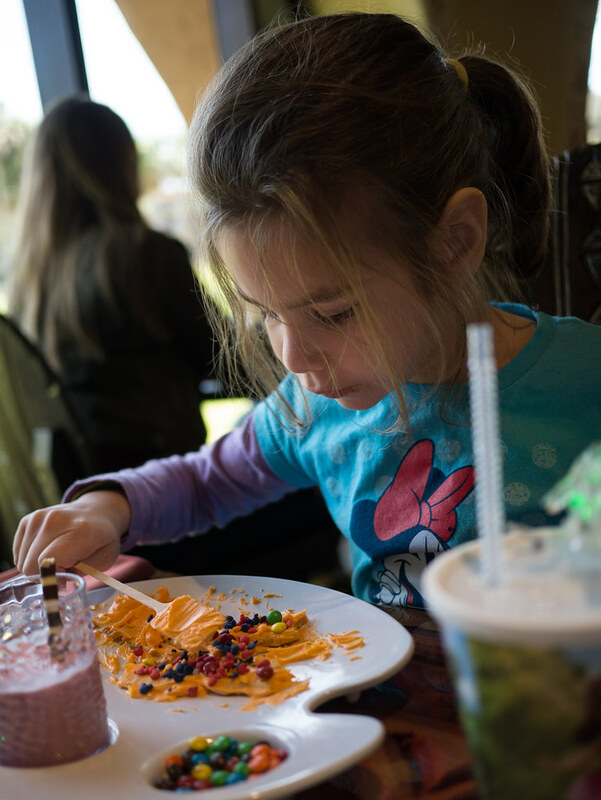 The girls also appreciated that they had a fun-filled dessert for kids - Decorate-Your-Own Sugar Cookie. Leah might have put enough icing on this one. After lunch, we had a FastPass for Finding Nemo - The Musical for the 1:00 show. To use the FastPass, we had to be there by 12:50. We finished lunch at 12:30, waited for the bus, rode it to the Animal Kingdom Lodge where it picked up more passengers, rode it to the park, went through security/bag check, re-entered the park, and booked it to the show (which was very far from the park entrance). We got there at 12:58, too late to use the FastPass but not too late to get into the show and sit at the very back. Regardless, we enjoyed it. 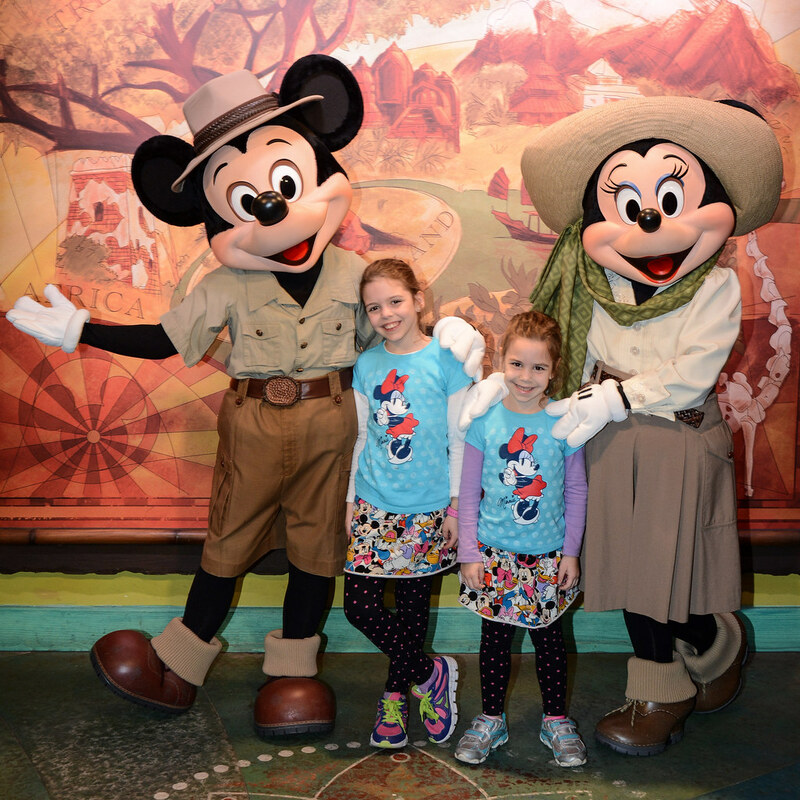 The girls hadn’t been excited about meeting any characters lately, but they decided they did want to go see Mickey and Minnie again. We then wandered into DinoLand, thinking that the Primeval Whirl looked like a fun ride. We started to walk in, only to find out Leah wasn’t tall enough to ride. We decided no one would ride it without her. So, instead we hopped on the TriceraTop Spin, which is a lot like the Dumbo ride at Magic Kingdom. We then heard music, and found the Viva Gaia Street Band! playing some fun tunes and leading dancing. Molly quickly jumped into the action. And then we were done. 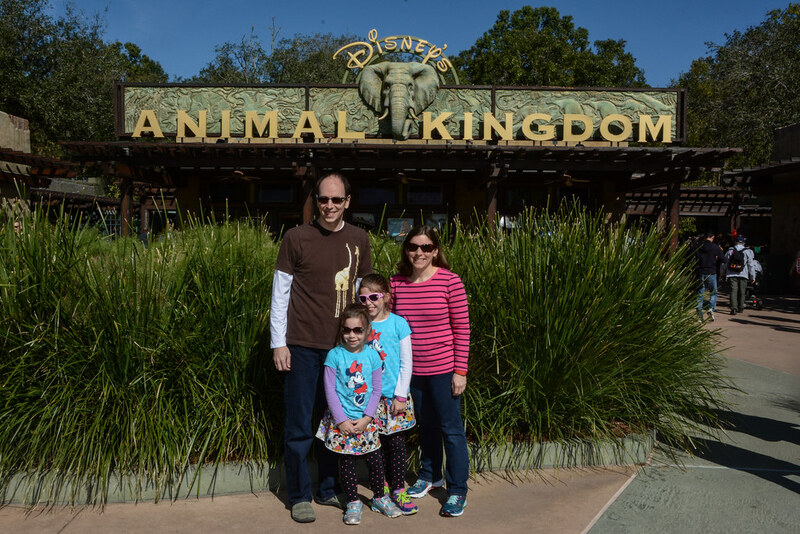 We had hit the main things we wanted to at Animal Kingdom, and it was time to head toward the airport. We took the bus back to our hotel, collected backpacks, and waited on Disney’s Magical Express to the airport. And everyone was still smiling. The trip was fantastic, and there’s very little we’d do differently. We were very glad we took advantage of every minute. We got home around 10:00 - extremely tired and not looking forward to waking up for school the next morning. Fortunately, the next day ended up being a snow day, so the girls got to recover a bit before getting back into the usual routine. 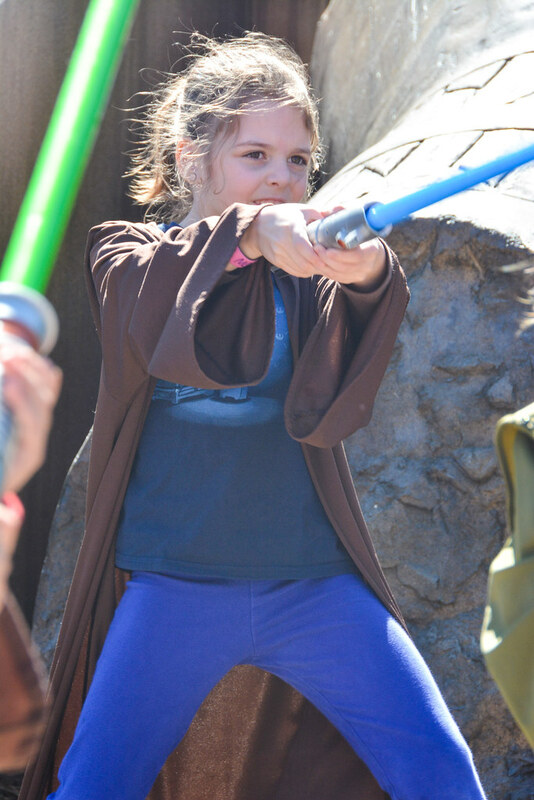 While at Hollywood Studios, the girls joined in Jedi Training: Trials of the Temple (previously known as Jedi Training Academy). 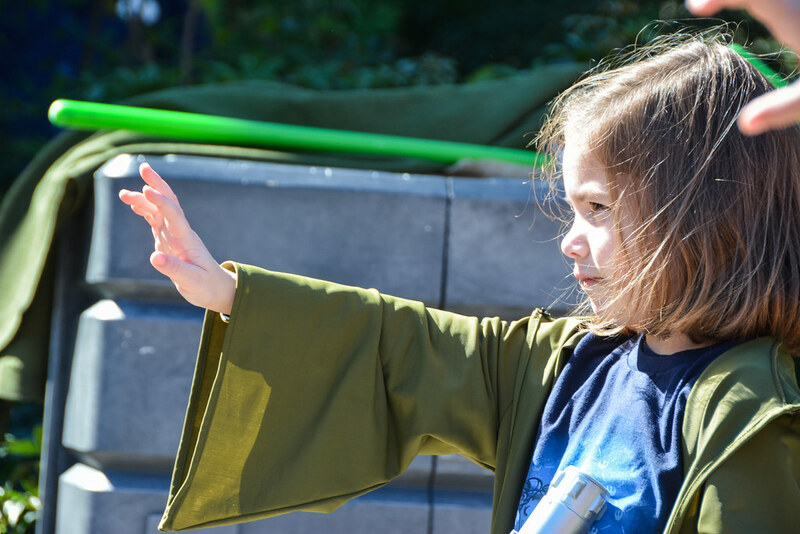 This is an awesome experience for any Star Wars fan (well, at least any fan between age 4 and 12, leaving some of the parents around wondering if they could pass as one of their kids for a bit ;) ). It’s also one of the hottest tickets in town and there are no FastPasses for it. So, we made sure to get to the park right when it opened to sign up. Even so, we ended up in line for about 30 minutes just to sign up. Our girls got into the 12:40 group, and they told us to be back there at 12:10 to get ready. When we got there at 12:10, there was a little bit of standing around as everyone gathered. We took advantage of the time, pulled out our PB&J sandwiches, and ate the quickly. 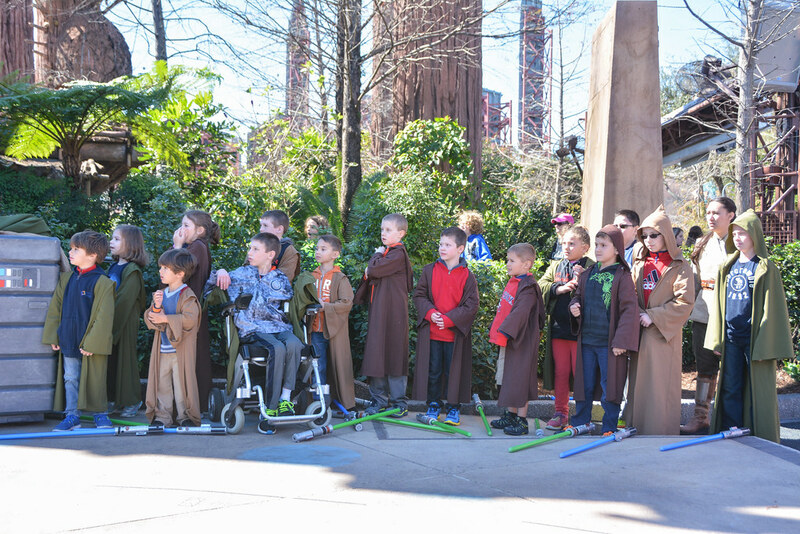 Once all 30 of the kids had arrived, they lined them up in height order and gave them Jedi robes. 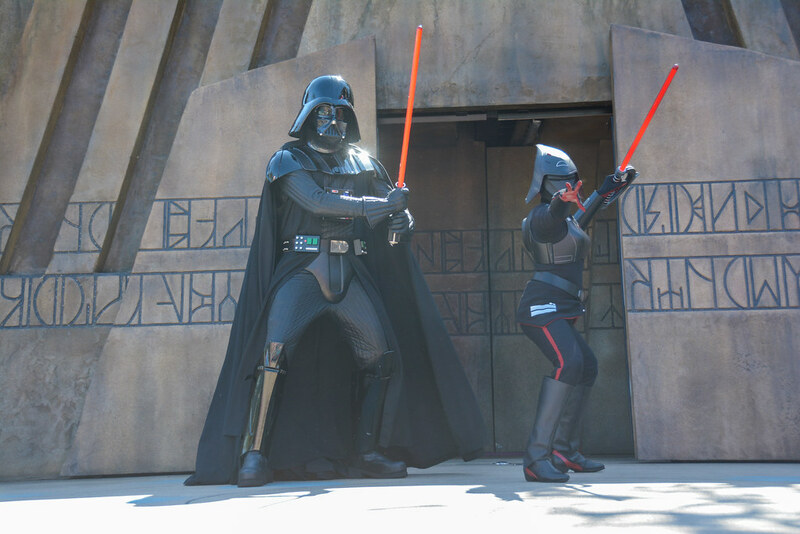 They then marched from Indiana Jones Adventure Outpost to the Jedi Temple next to Star Tours. 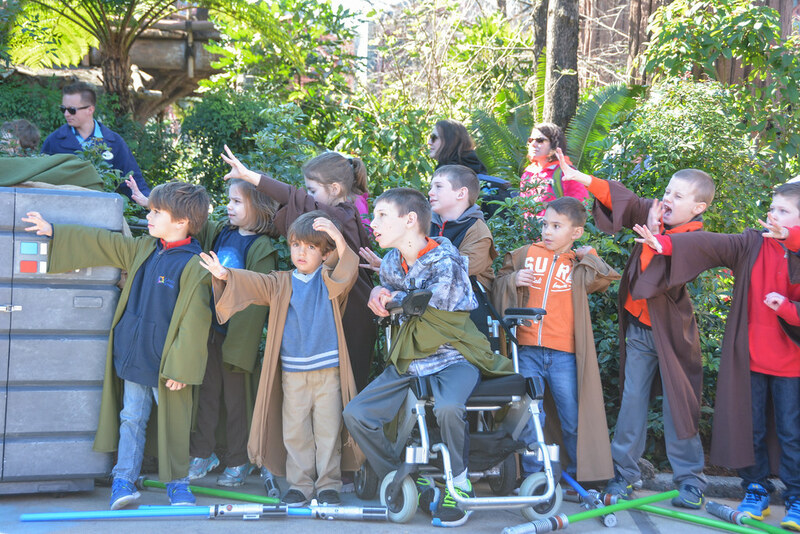 They were led by a banner-holder who continually yelled “Make way for the future of the Jedi Order”. After arriving at the temple, the fun got started. 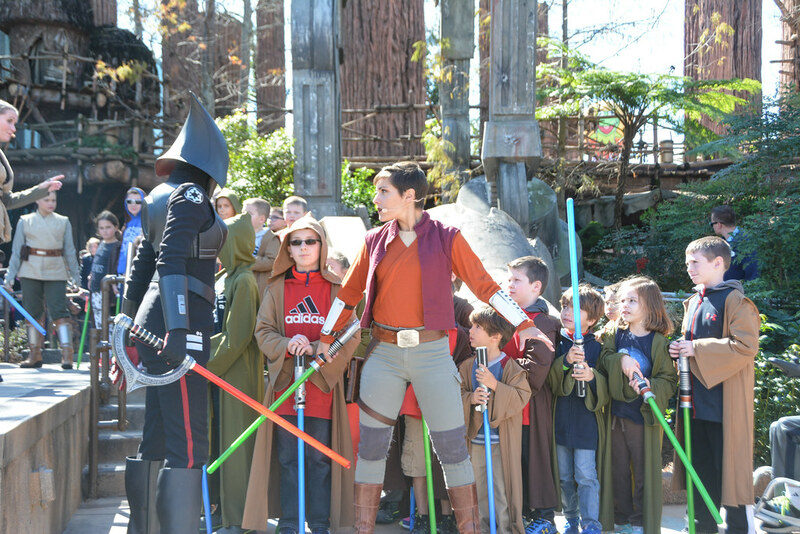 Our younglings were met by 4 Jedi - one master, her apprentice, and two other students. And then the training began. 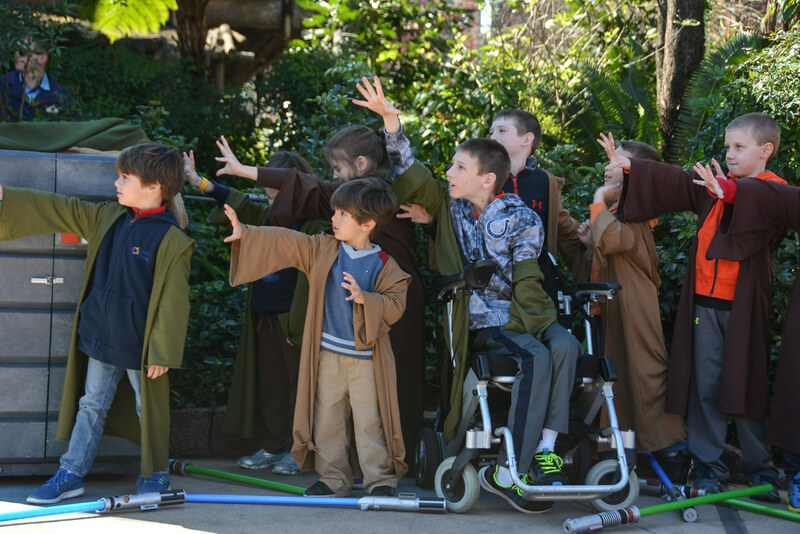 Each youngling was given a lightsaber, and they were all taught a bunch of moves. They repeated these in sequence to practice them. But then, the trials started. Their darkest fears were realized when Darth Vader and the Seventh Sister Inquisitor arrived. 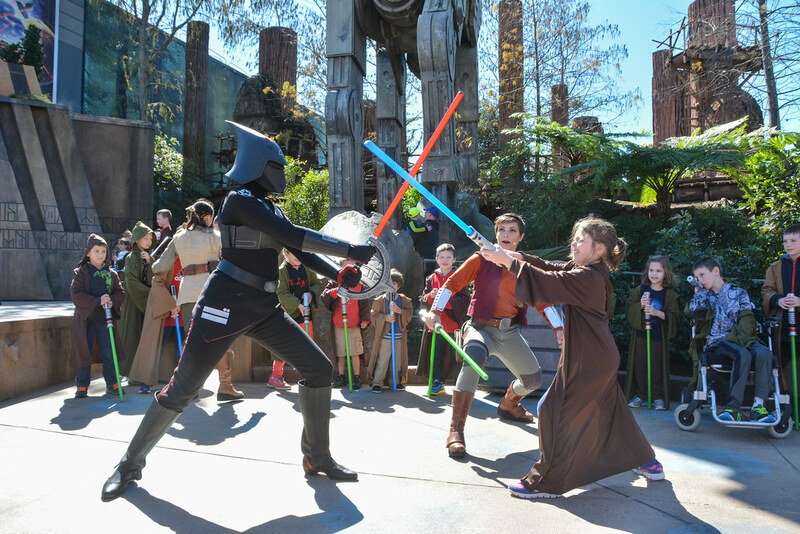 But they learned to face their fears, and each got a chance to fight one of these evil Sith. Both Molly and Leah were in the group to fight the Seventh Sister, which was fortunate since we’d just caught up on the second season of Star Wars Rebels and she was fresh in their minds. 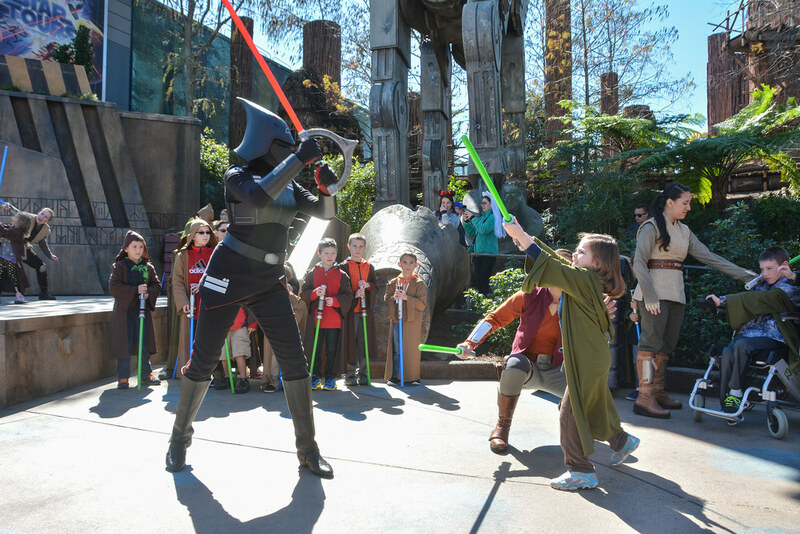 In the end, lightsabers were not enough to get rid of the evil ones, so they had to use the force to push them away. 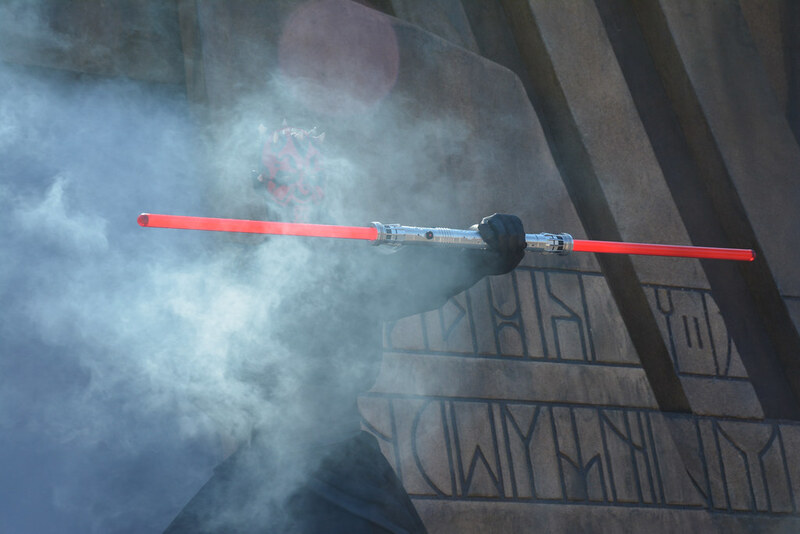 But wait, Darth Maul showed up as well, with his acrobatic double-sided lightsaber moves. But we all used the force to push him away as well. There was a lot more to the show, but I think you get the idea. For a Star Wars fan, this was as fun as it gets. 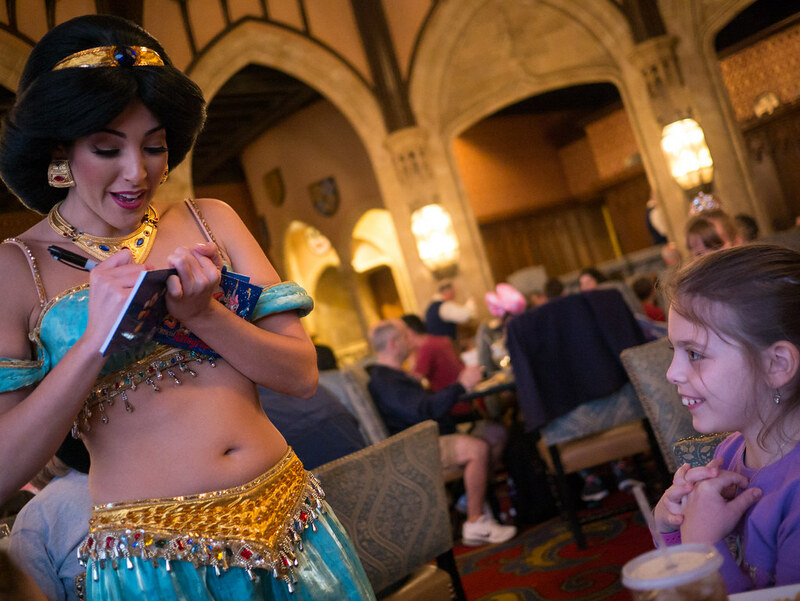 It’s also got to be the most interactive attraction at Disney World. Where else do you get to be up on stage for 20 minutes, including fighting the bad guy one-on-one? The girls say this was their favorite part of the trip, and even though I experienced it vicariously, I’d say it was my favorite part as well. I highly recommend it for any Star Wars fans who meet the age requirements. 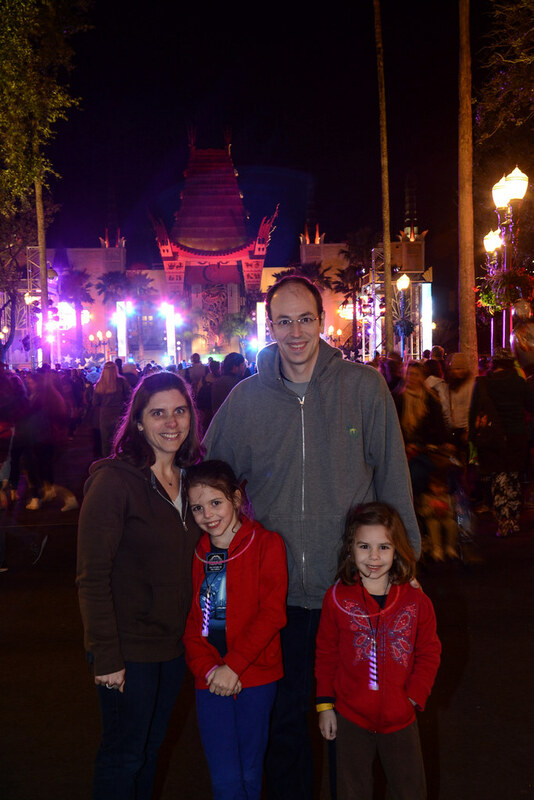 On Sunday, we woke up early to head to Hollywood Studios (formerly known as MGM). 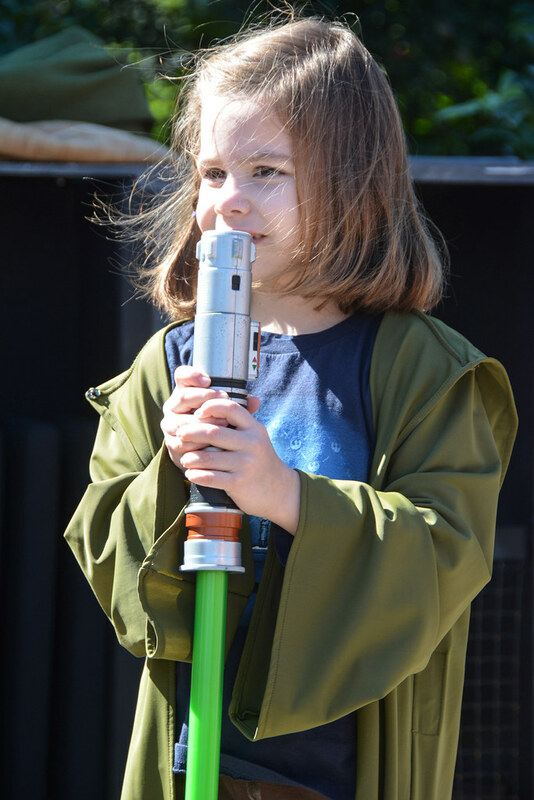 Our first stop was to sign up for Jedi Training, which was the thing the girls were looking forward to the most of the trip. It was so awesome it deserves its own post, so you’ll have to wait until tomorrow to hear about that. For now, just know that we got there in time to sign up for a session after noon, then headed out to have other fun in the park. 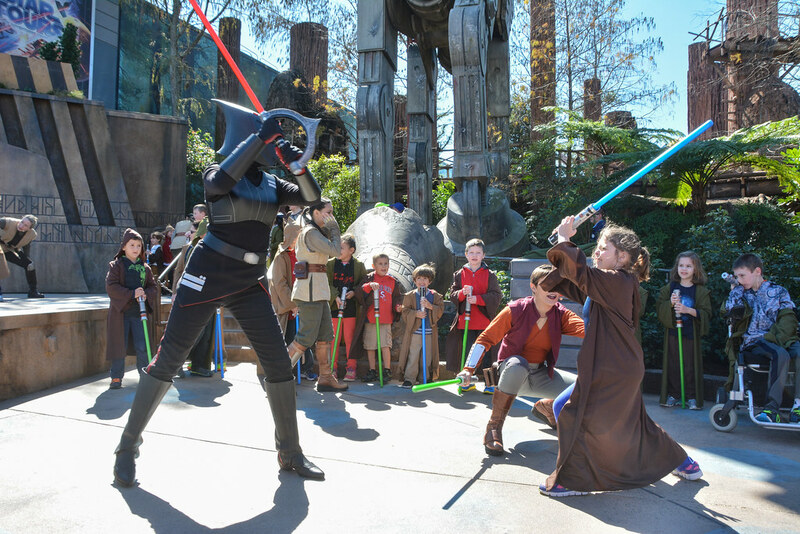 These days, Hollywood Studios is full of Star Wars stuff. 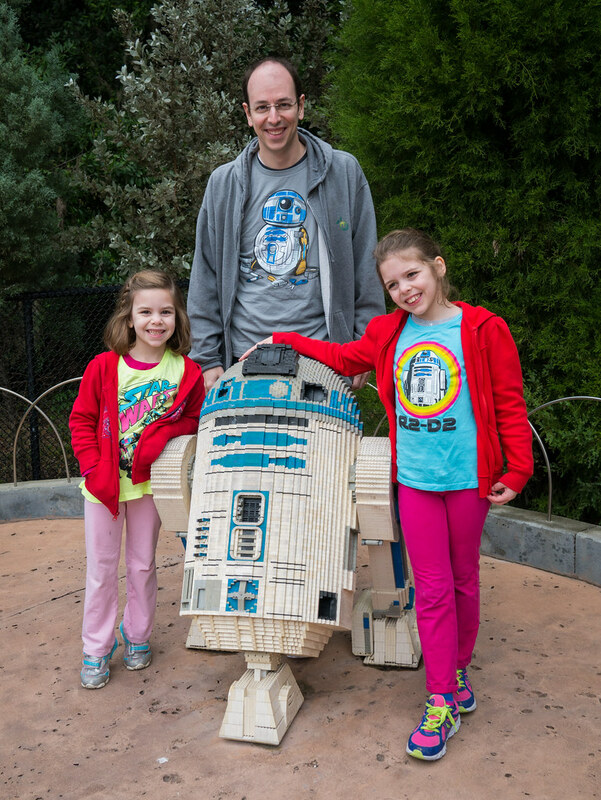 The girls and I are big Star Wars fans, which is why the three of us were looking forward to it more than any other day. 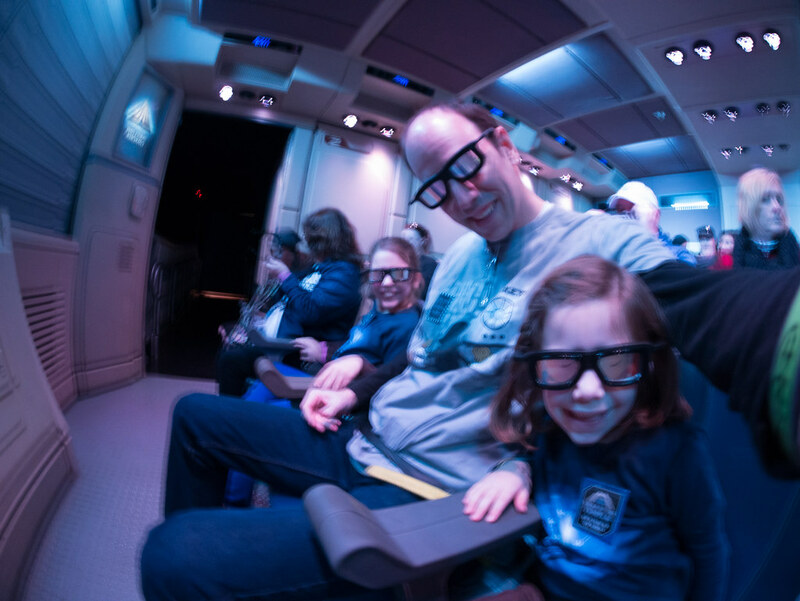 So, we took advantage of our Extra Magic Hour to go on Star Tours. Jen even got caught up in the Star Wars excitement so much that she joined us, despite it being the kind of ride that usually doesn’t sit well with her. The girls and I loved it (Jen less so) - such a fun ride to get in on the Star Wars space travel action. 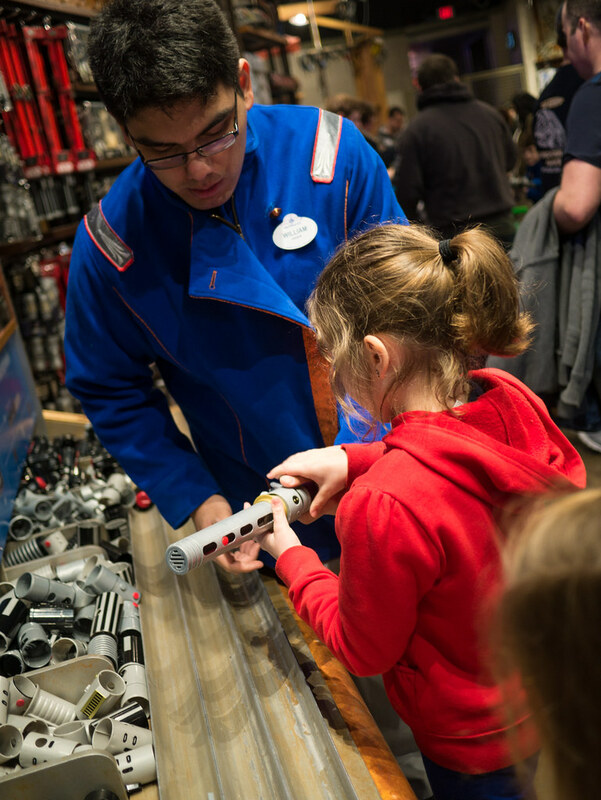 The exit for Star Tours leaves you in Tatooine Traders, which is a great place to shop for Star Wars stuff. 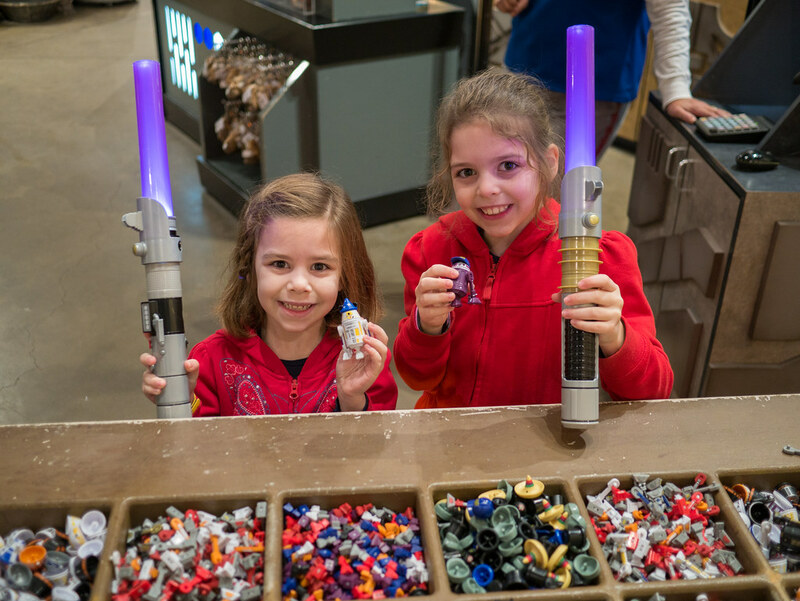 They even let you build your own lightsaber, which both of the girls were looking forward to. They both had Disney gift cards (thanks G’Mom and Grampa), and had saved them for this. Thanks to William from Endor for helping the girls with constructing their lightsabers. 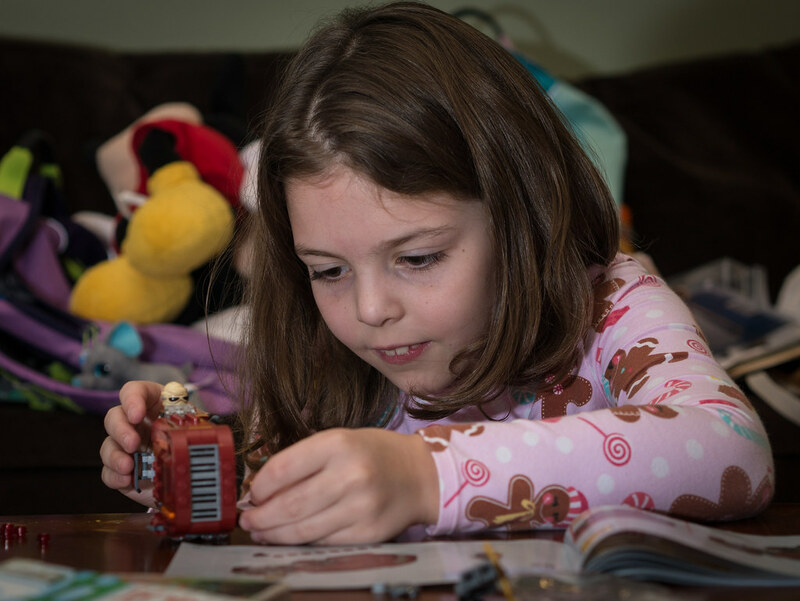 Not only can you build lightsabers, you can build little droids as well. The girls were excited to do so. Here they are with their lightsabers and droids (R8-D8 and R2-L2). A few notes for those interested - the lightsabers are $25 each for standard ones like ours, though they can be up to $45 if you want double sided with Kylo Ren cross guards on each side. Droids were $22 for two of them (I think). We did this early, and discovered that was the best thing to do as the place gets crowded and the supplies get less plentiful as the day goes on. We tried to have them send our stuff to our room so we didn’t have to carry it, but they said it might not make it before we checked out the next day. Instead, we had them send the items to Package Pickup where we picked them up at the end of the day. 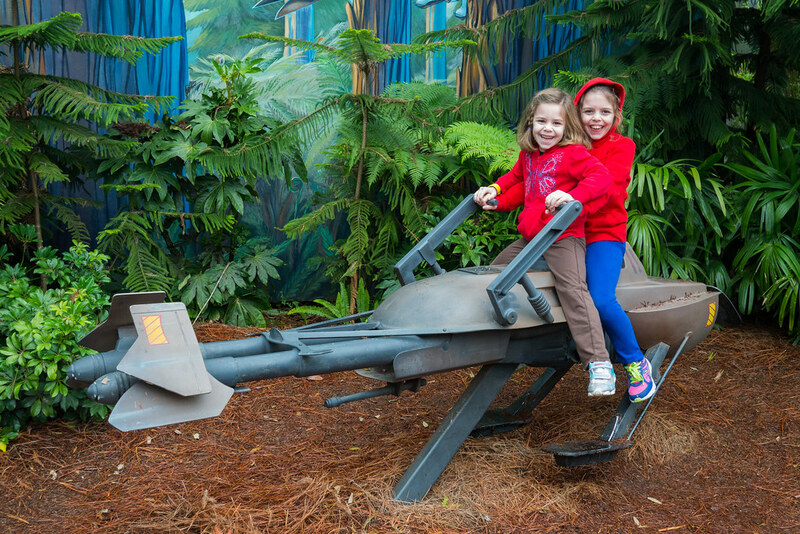 Outside, the girls got to sit on an Imperial Speeder Bike. Then we headed off to our first FastPass of the day - Toy Story Midway Mania, which was lots of fun. Then we thought we had some time before our next FastPass, so we hopped on the Great Movie Ride. We didn’t have as much time as we thought, but thankfully the attendant at Voyage of the Little Mermaid let us in despite being late. We ended up having to wait for the next show there, but that wasn’t a big deal. Then, on to our last prebooked FastPass - For the First Time in Forever: A Frozen Sing-Along Celebration, which was funny and fun. 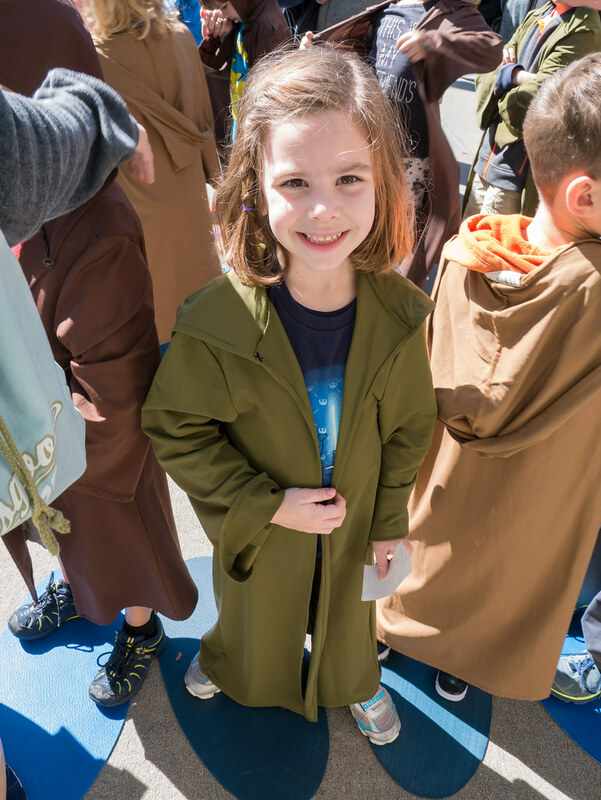 We then headed back to Jedi Training, where we ate our PB&J sandwich lunch standing while they gathered the kids together (more on that tomorrow). After Jedi Training, we headed over to Muppet*Vision 3D. 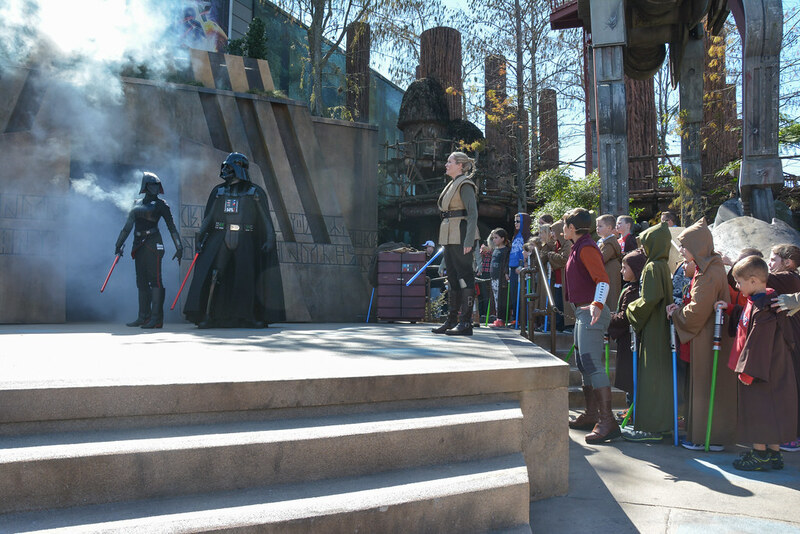 It was a fun show, and next to a kiosk we could use to book an additional FastPass (for Star Tours again, of course). But that FastPass was for several hours later, so we instead opted to check out other Star Wars stuff. We went to the Star Wars Launch Bay, where we got to watch a short behind-the-scenes movie and then look at a bunch of movie props. Then we walked over to Sunset Boulevard to see Beauty and the Beast - Live on Stage. There wasn’t much else for us over on Sunset Boulevard, so we headed back to the Animation Courtyard for a family picture. 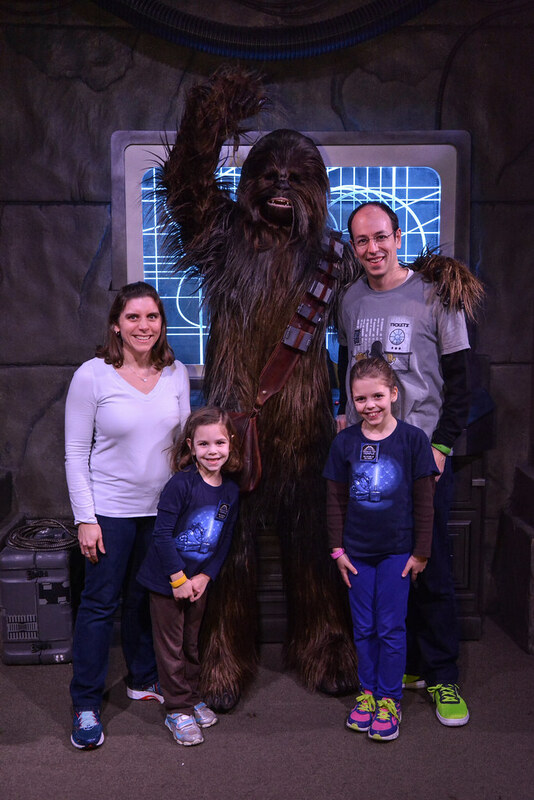 Family pictures with signs are fun, but family pictures with Wookies are even better. 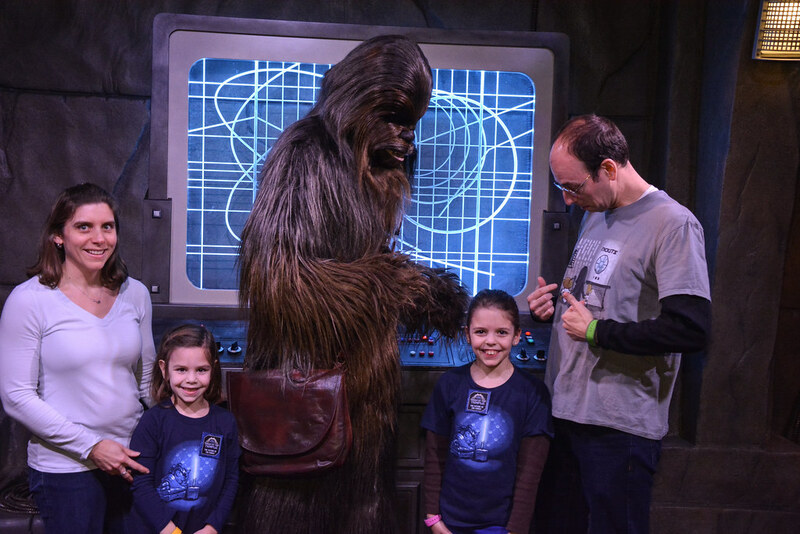 So, we headed back into Star Wars Launch Bay to wait in line to meet Chewbacca. The girls also wanted his signature, but we were told that he was not signing anything to avoid leaving a paper trail that the First Order could use to track down the Resistance. Chewie wasn’t sure about my shirt when he saw Darth Vader on it, but he seemed to be OK with it after I pointed out Luke, Leia, and her Chewbacca doll. 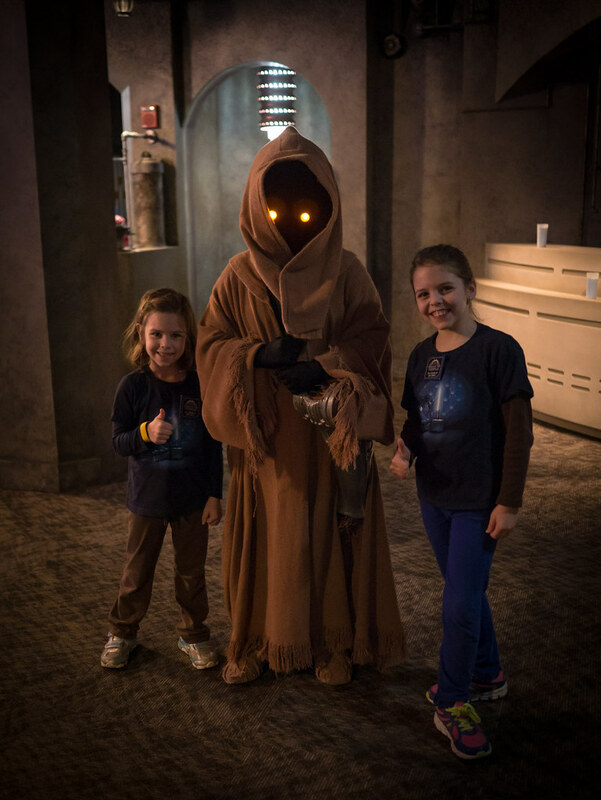 We also met a Jawa wandering around there. After that, it was time for a snack. Everywhere you walked, you could smell the popcorn, and the girls really wanted some. 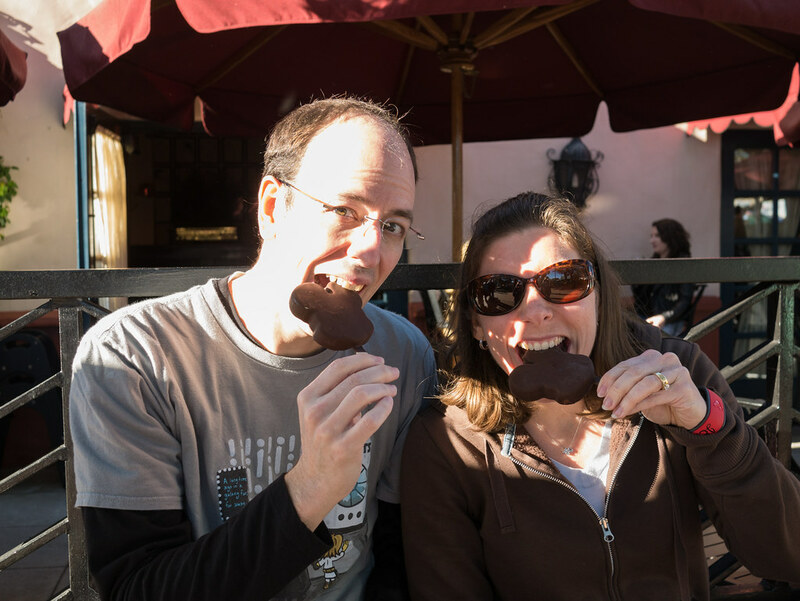 Jen and I instead opted for something that brought me back to my childhood - Mickey Mouse Ice Cream Bars. These aren’t the same ones I remember (those were vanilla ice cream with chocolate ice cream eyes and mouth, and only the ears were dipped in chocolate). But these were still excellent. At that point, we’d done most of the stuff we wanted to. 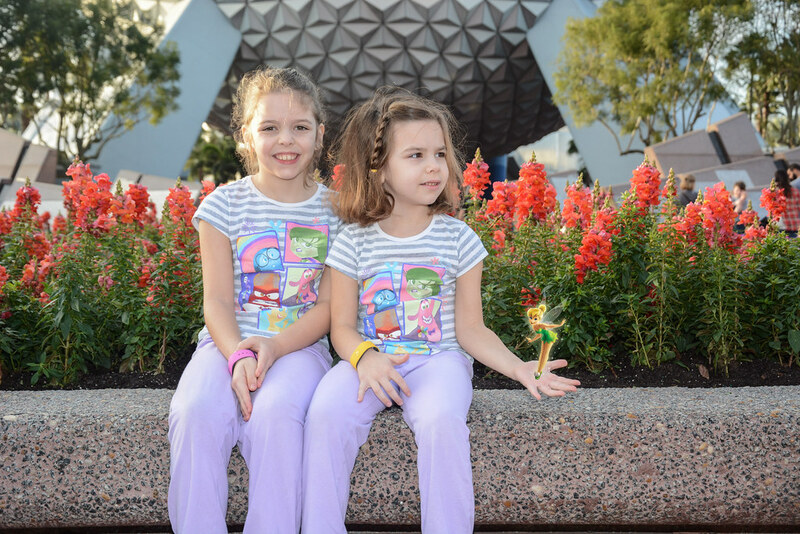 The girls kept asking to go back to Star Tours, but our FastPass there wasn’t for another hour. So, we decided we’d just stand in line for it (well, the girls and I would - Jen was not up for a return trip). Here we are ready for our second space flight with front row seats. After we got off the ride, it was about time for our FastPass, so we went back for a third time. Note that they do have a bunch of different elements that they mix together, so each ride was slightly different. For dinner, we had our only quick counter-service meal of the trip at the ABC Commissary. Then we headed to get a seat for some evening entertainment at 7:00. Fantasmic is a huge character, fireworks, and water show (they even project video onto a sheet of water being sprayed into the air). It was very cool. 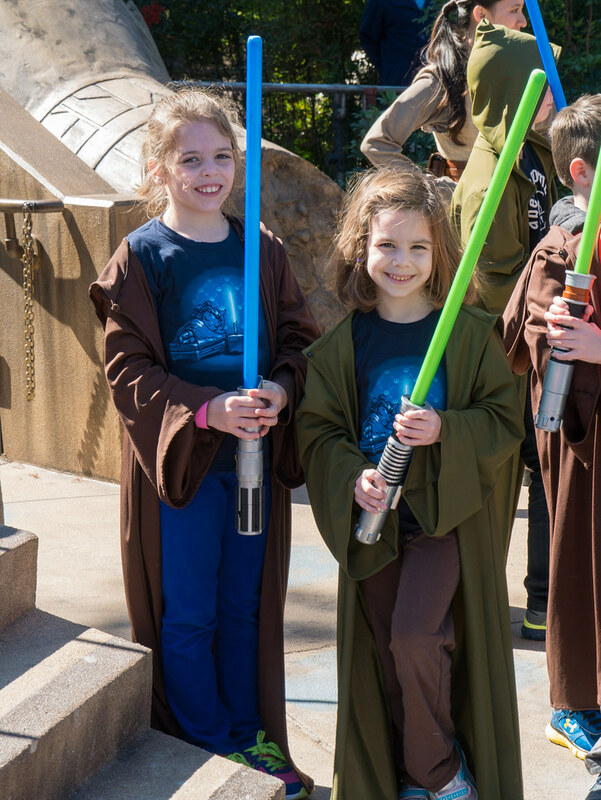 Then we swung by Package Pickup to get our lightsabers and droids, and headed to the Animation Courtyard to watch Symphony in the Stars: A Galactic Spectacular - a Star Wars-themed fireworks show at 8:00. It was the perfect finale to a fantastic day. Note that we stayed at the park all day. It was crazy busy, and the girls loved it so much there was never a hint of exhaustion. We left the hotel at 7:30 in the morning and got back around 9:30 at night. Our girls are awesome. 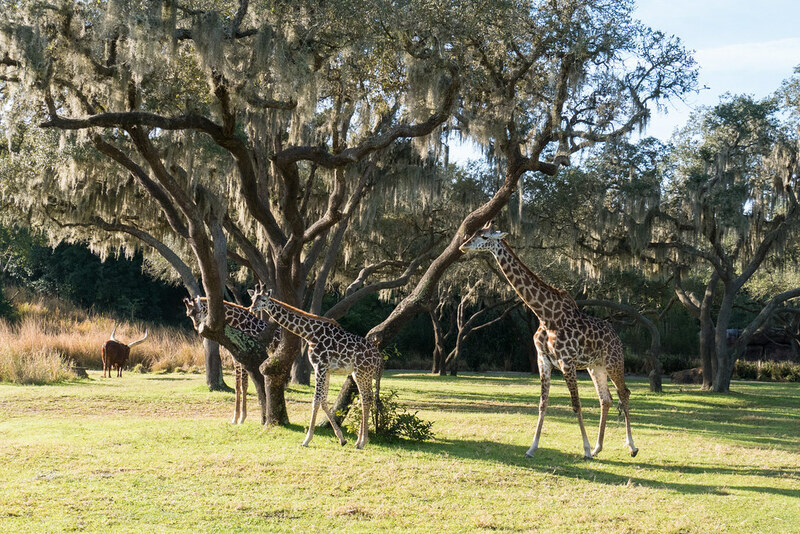 While Disney World is awesome, it’s not the only bit of fun in the Orlando area. 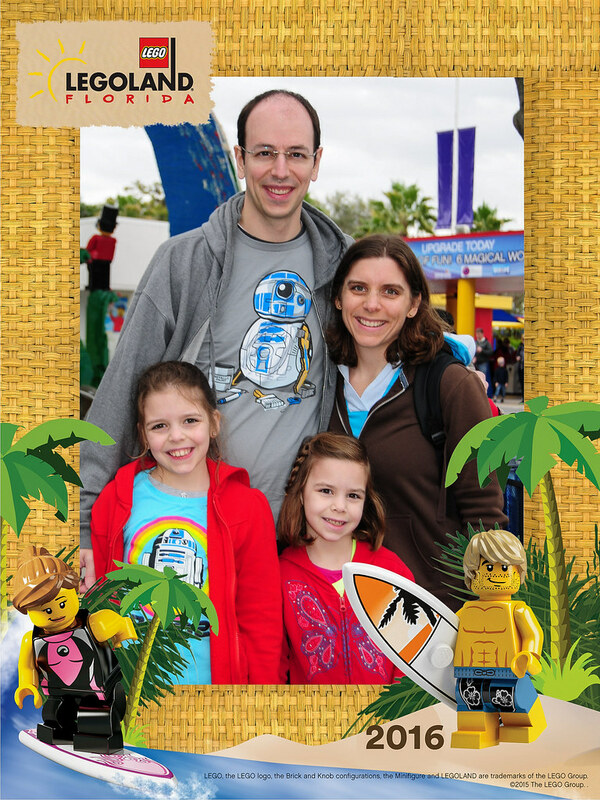 So, Saturday we chose to leave Disney World for the day to try out a different park - Legoland. Since the girls love Legos so much, we couldn’t pass up the opportunity to check it out while in town. 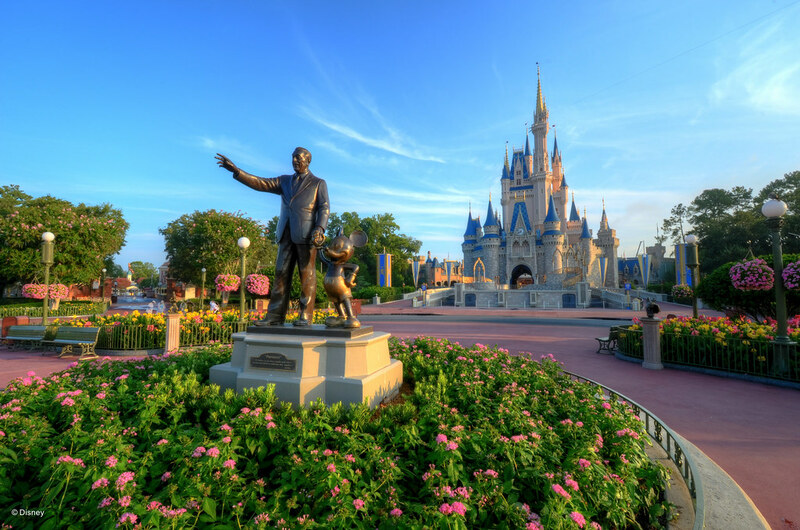 To get there, we rented a car from the Car Care Center in Disney World using a deal from Undercover Tourist. They picked me up from our hotel and brought me to the center to get our car. When I told them I wasn’t interested in upgrading from our Economy (Kia Rio or similar) car, they told me they didn’t have any and gave me a lovely Jeep Patriot. We hopped in, and off we went, to be at the park when it opened. 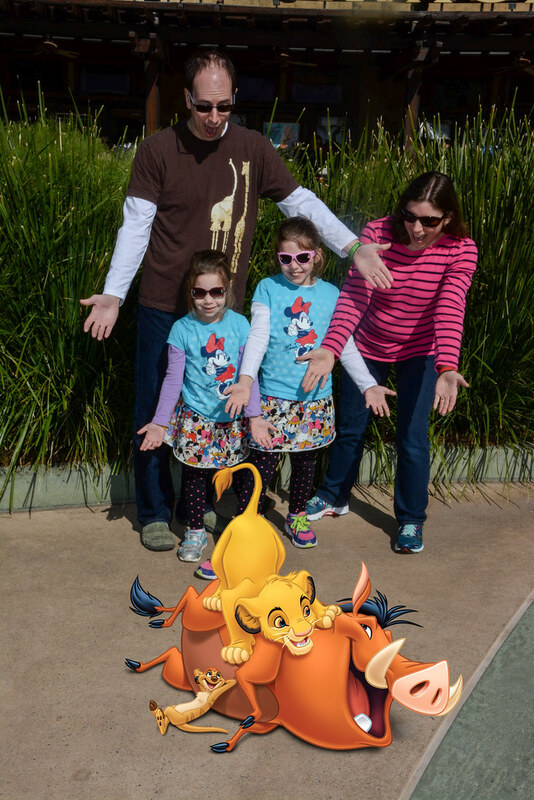 We opted to pay $40 for their photo package, which turned out to be underwhelming compared to the Disney one. Oh, well - live and learn. All the pictures here with borders are from them. 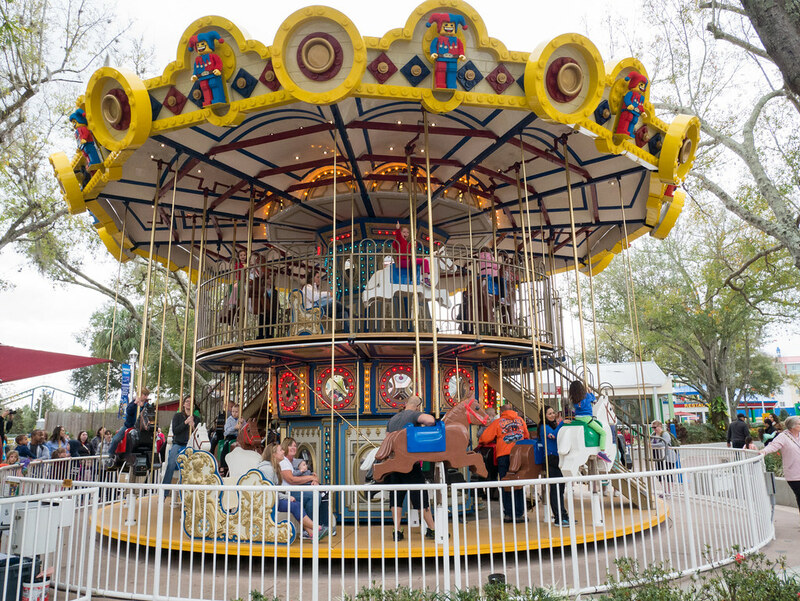 Upon entering the park, one of the first things you see is the carousel. That’s right - they have a double-decker carousel where all the horses are giant Lego horses. We got in line right away and made sure to get a horse on the top level. Then we wandered over to Heartlake City. 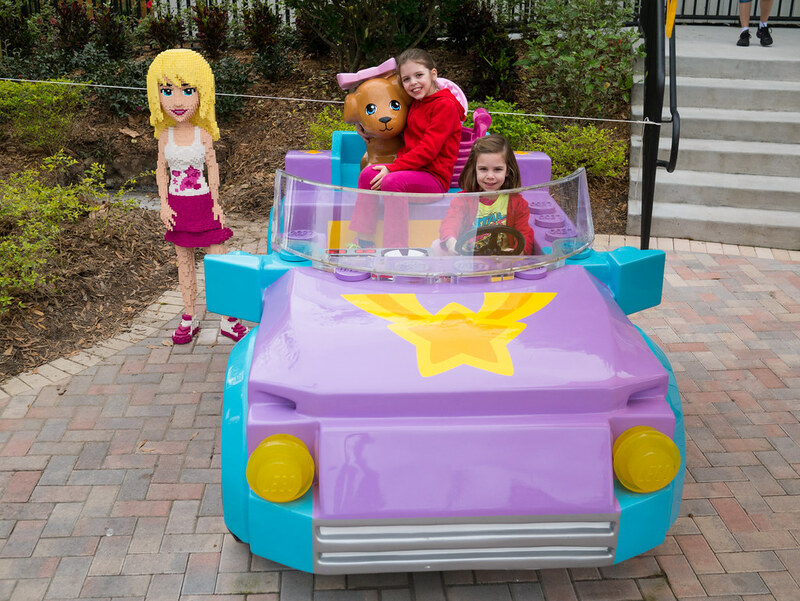 The girls have long been fans of Lego Friends, and were excited to see that part of the park. Unfortunately, the only ride over there was not for us. Leah was not tall enough to ride it, and Molly knew she’d get sick if she tried it (as would Jen or I). So, we passed on it. Instead of riding anything in Heartlake City, we decided to head toward a different ride. On the way there, we passed through Miniland. It had some of the most impressive Lego displays I’ve seen. Also, it had a small activity. 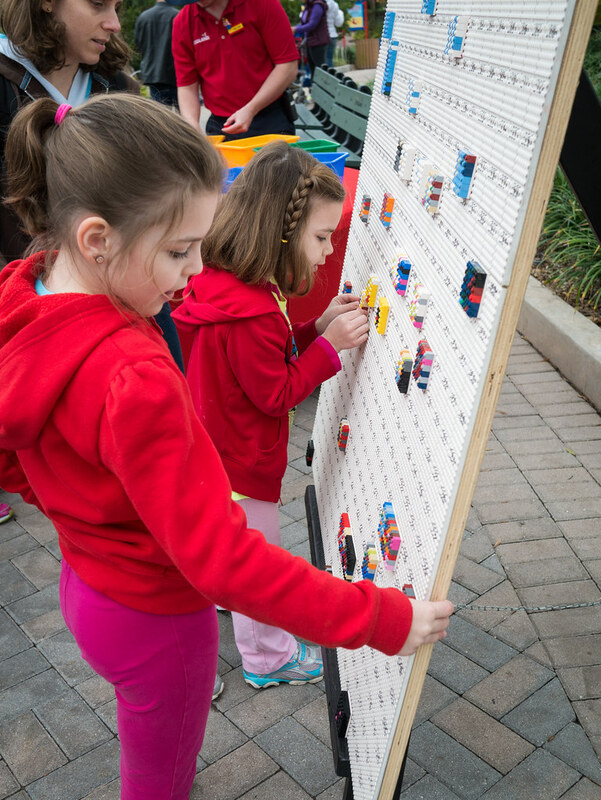 They were creating a mural out of Legos. Each of us could take one square and build it with the provided Legos according to the pattern on the square. Then we stuck our square on the giant board in its appropriate spot. None of us knew what the final mural would look like, but it was fun to make anyway. Next we made it to the ride that the girls had been looking forward to - Coastersaurus. 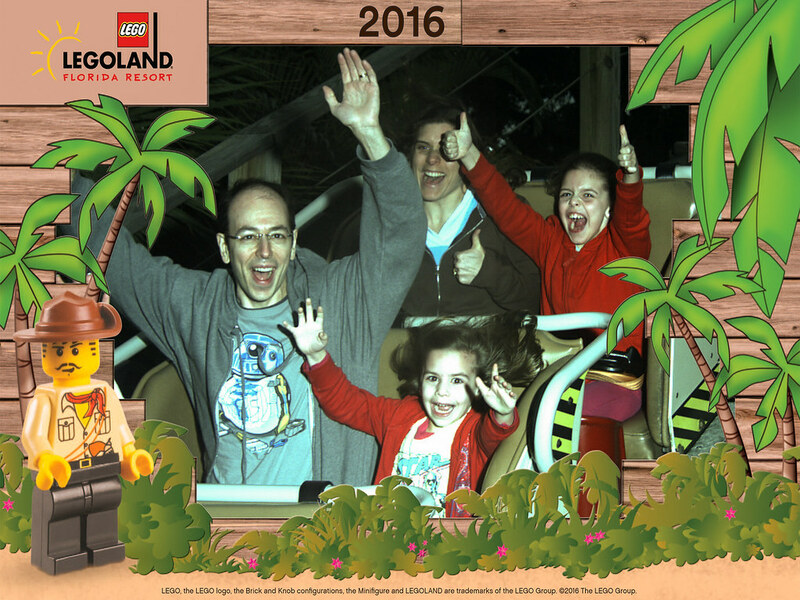 This dinosaur-themed wooden roller coaster was right up our alley (now both my girls have developed a love for wooden roller coasters like mine). Leah rode with Jen and Molly rode with me. This coaster did have a couple of decent drops in it, but that didn’t scare Molly off. Leah did not like it the first time around. But, she said she wanted to try it again. Jen and I figured she’d change her mind about doing it again, but she didn’t. There was absolutely no line, so we went back for more. This time Leah rode with me and Molly with Jen. Leah did great the second time - so well that she even lifted her arms after a bit (another first for her). 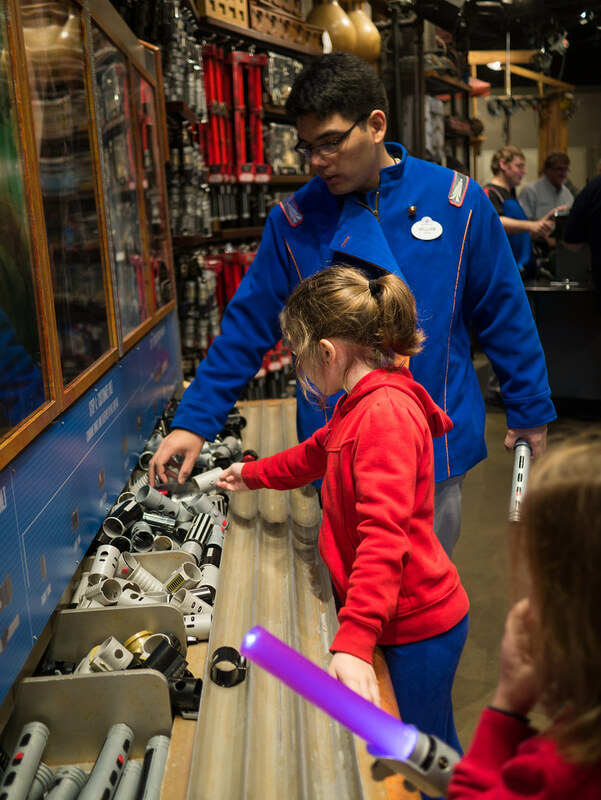 We then wandered over to my favorite part of the park - the Star Wars section. 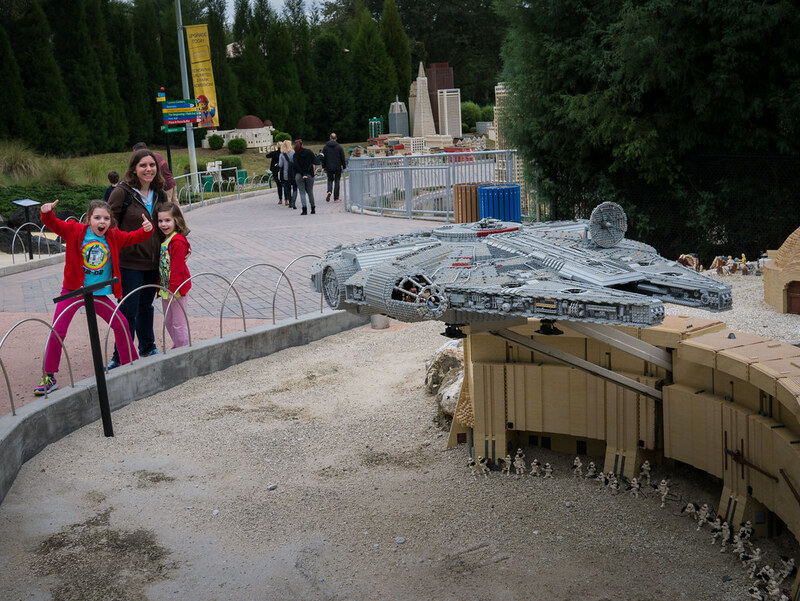 There were several life-size Lego builds of Star Wars characters, including R2-D2. Molly was amazed at this Millennium Falcon, which was even lifted up and lit up in back. There were several scenes from throughout the movies around the area, most of which had buttons you could push to make things happen (Luke climb up the cable under a walker, Obi-Wan and Anakin have a light saber battle, etc.). Then we found a picnic table to eat our PB&J lunch. We planned to go on the Project X ride after we finished eating, as it was near our picnic table and looked like fun. Sadly, that’s when it started to rain. And shortly after it started to rain, we heard them stop Project X due to the rain. They actually shut down many of the rides due to the rain (maybe they were afraid of lightning, but I never saw any). So, we had to find other things to do. 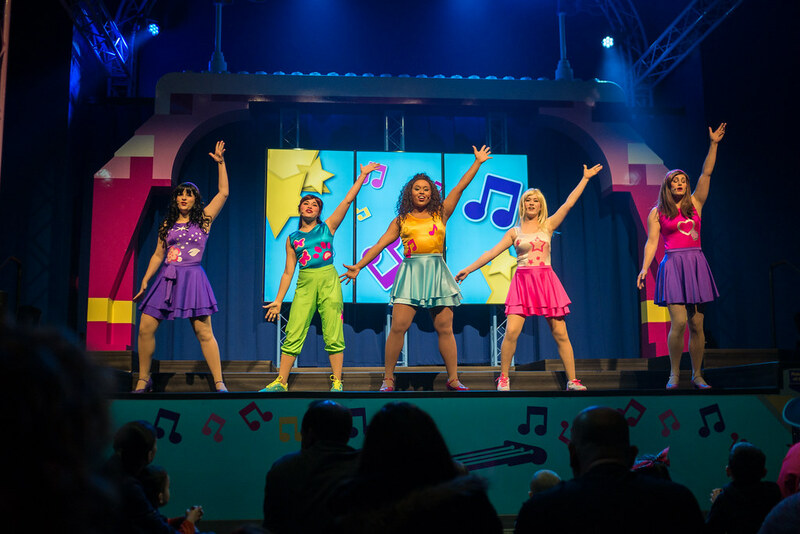 First we headed to see the ‘Friends to the Rescue’ Live Stage Show, with fun singing and dancing. It contained lots of songs the girls knew from watching the TV show. 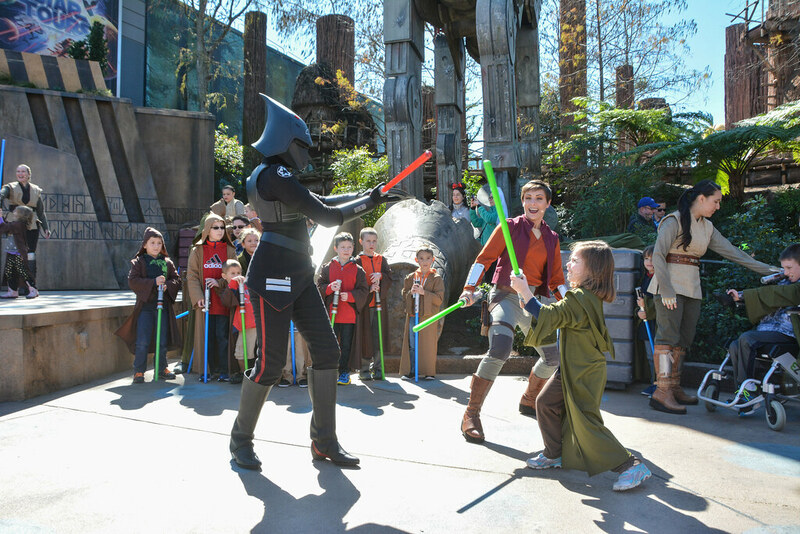 It seemed geared towards kids a bit younger than ours, but the girls enjoyed it anyway. After that, we wandered through a bunch of the shops. 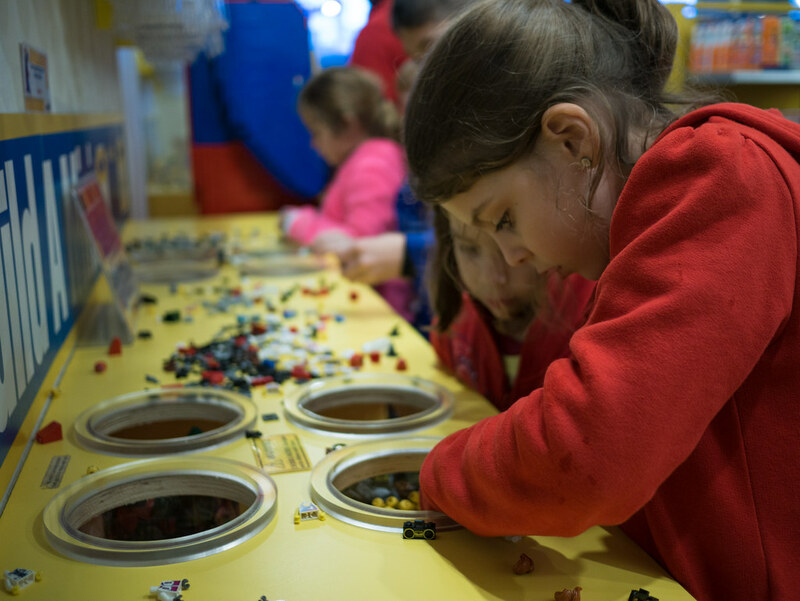 Surprisingly, they sell a lot of Legos at Legoland. We saw sets we’d never seen before from lots of different lines, including the giant crazy expensive ones. We gave the girls a budget and they looked for what the could get within it. No buying yet, but just making a list. 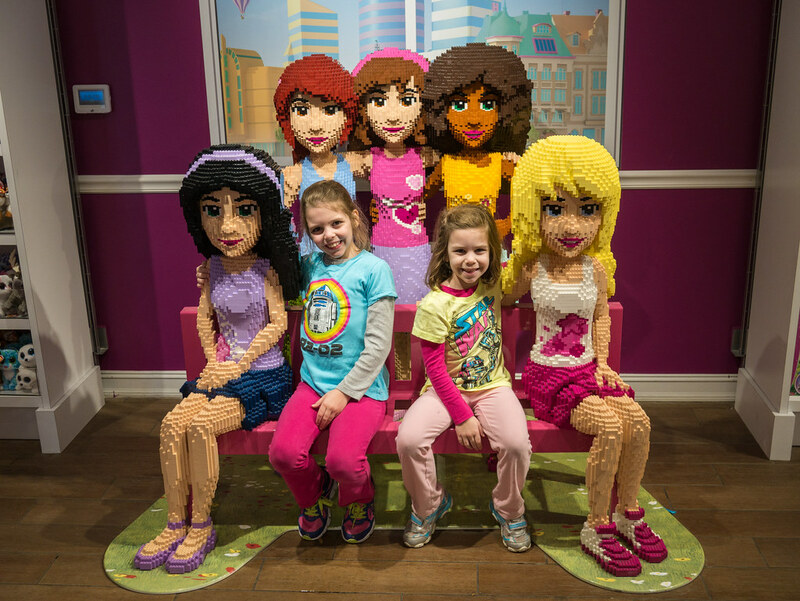 While browsing the Heartlake Mall, the girls sat down with some life-size Lego Friends. 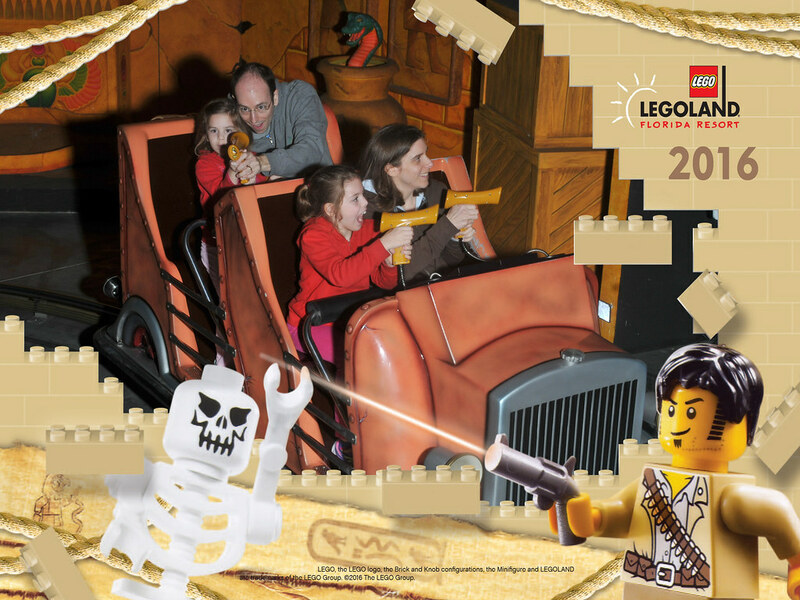 Then we headed over to the Lost Kingdom Adventure ride, where we got to ride through and shoot things. It was lots of fun. Leah didn’t quite get the hang of it the first time through, so we hopped back in the short line and did it again. I gave her a little help the second time around. 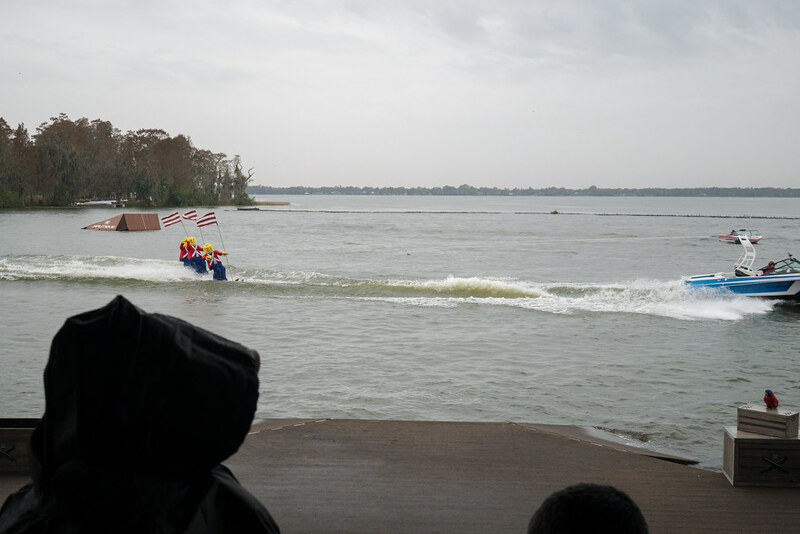 Then we headed to the Pirates’ Cove Live Water Ski Show. 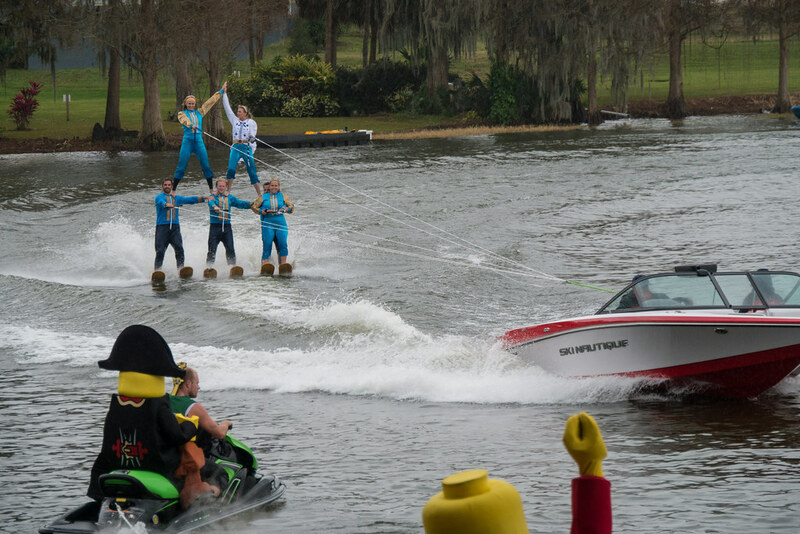 Yes, that’s right - Legoland has a live water ski show. We couldn’t believe it, and we certainly weren’t going to miss it. The stadium for it was covered as well, which kept us out of the rain (though the rain was slow at that time). The show was lots of fun, if a little silly. 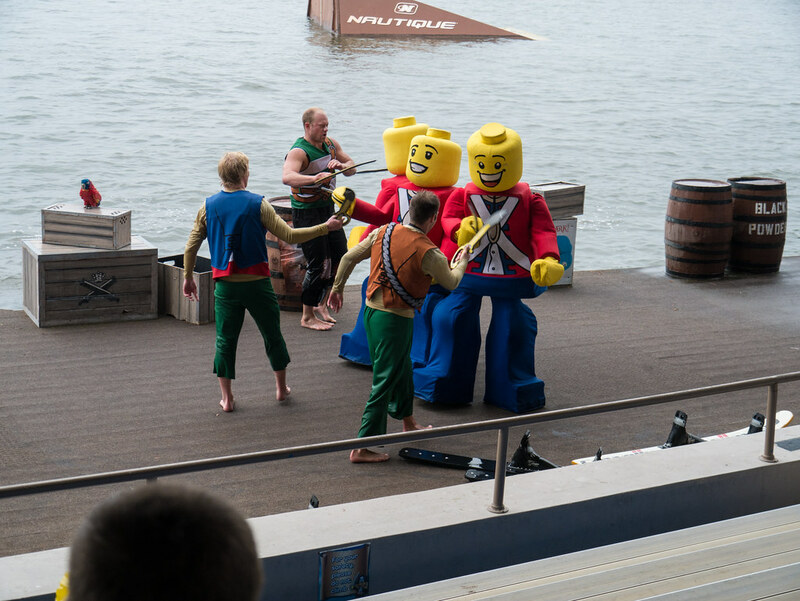 It was certainly the first time I’d ever seen life-size Lego minifigs water skiing. After the show, the rain gave us a brief reprieve. Leah wasn’t interested, but Molly wanted to try out the Kid Power Towers. Since Jen handles heights better than me, she and Molly pulled themselves up to new heights. Next we wandered into Build & Test. 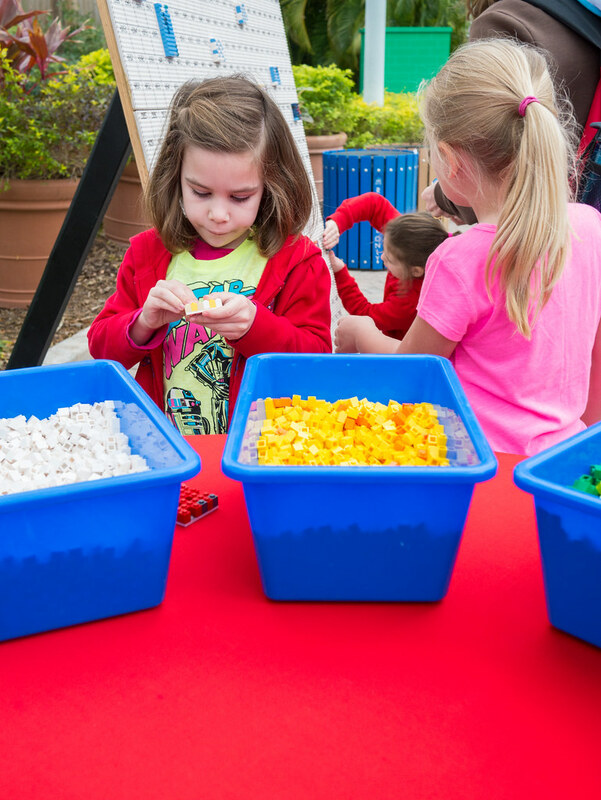 This is the most interactive part of Legoland when it comes to building things. 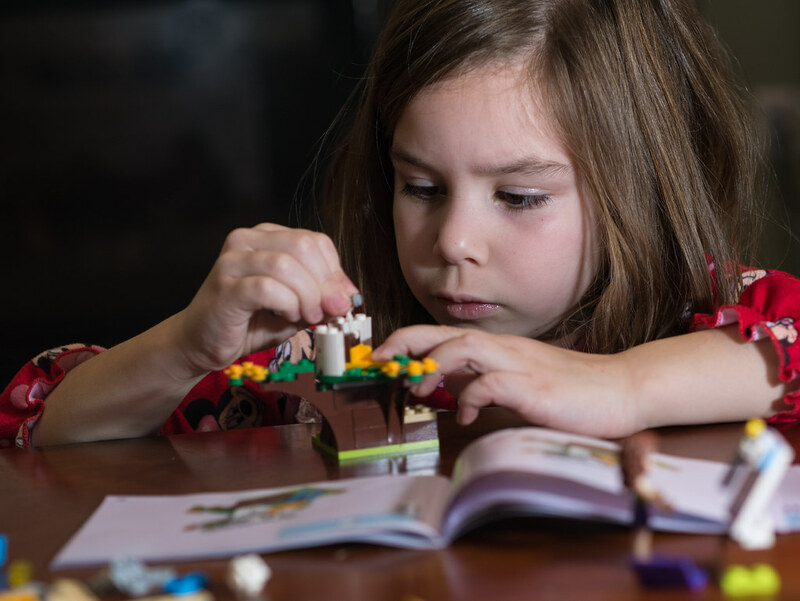 They even had Lego Mindstorms (programmable robots, like what Molly and I did after school), but you had to sign up for a 45 minute class in future time slots which was more than the girls were up for. But they also had cars that kids could build and race. The girls had fun with this, though they were tired by this point. When Leah’s car crashed and broke into pieces, and another girl picked up some of the pieces, she had the only meltdown of the trip. But after a bit she cheered back up. We then watched the only remaining show - The Lego Movie 4D: A New Adventure. After the movie, I wanted a snack. 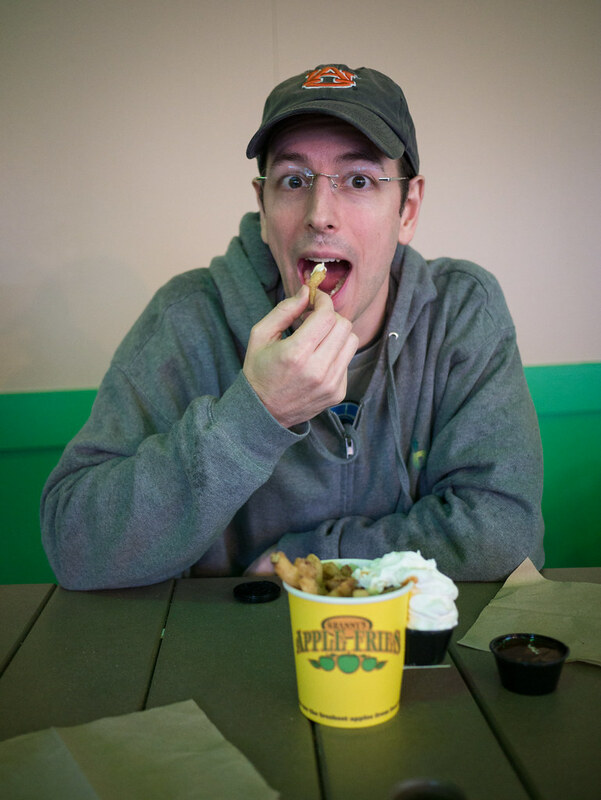 They have a very unique one - Apple Fries. These are Granny Smith apples, sliced up like french fries, dredged in sugar and cinnamon, fried, and served with whip cream and caramel to dip in. Yum! Jen and I both thought they were great. The girls thought they were weird. 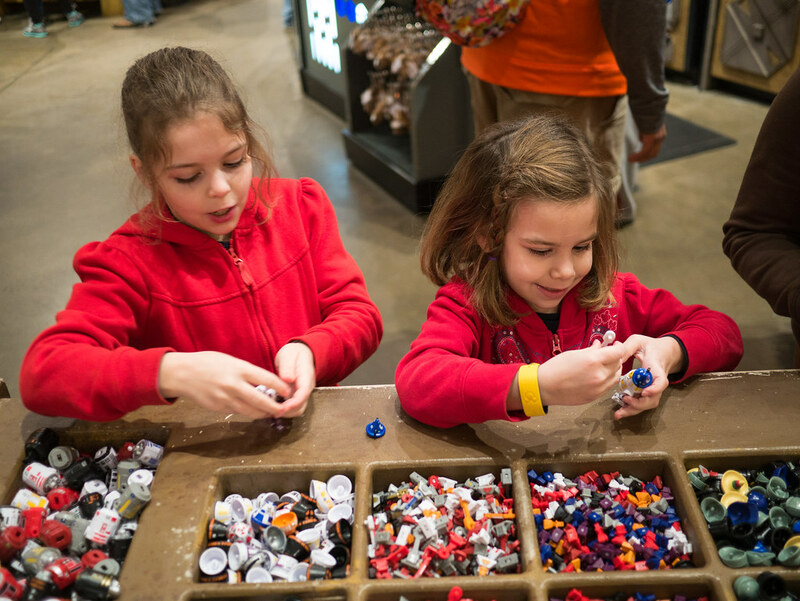 Then the girls got to do what they’d wanted to do the entire day - buy some Legos. 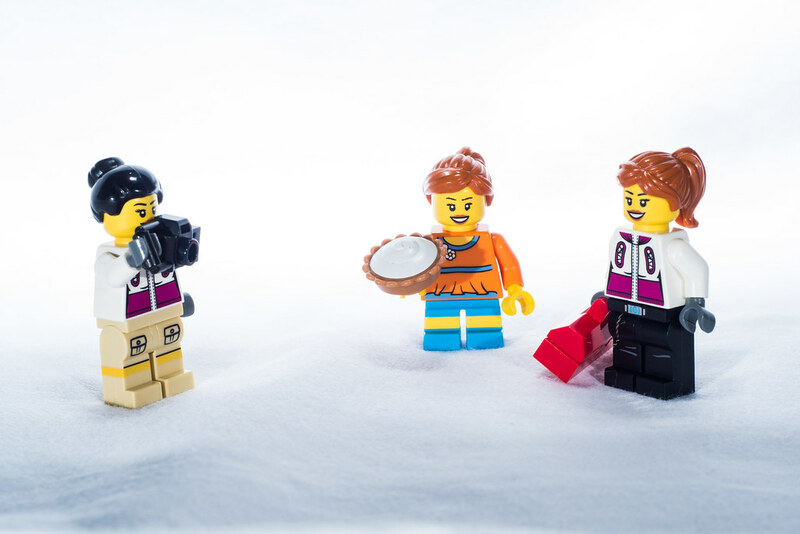 First, Molly built and purchased 3 minifigs at the Minifigure Market. Then, Leah bought the Olivia’s Exploration Car (with telescope and robot) as well as the Disney Palace Pets Daisy’s Beauty Salon set from the Heartlake Mall. 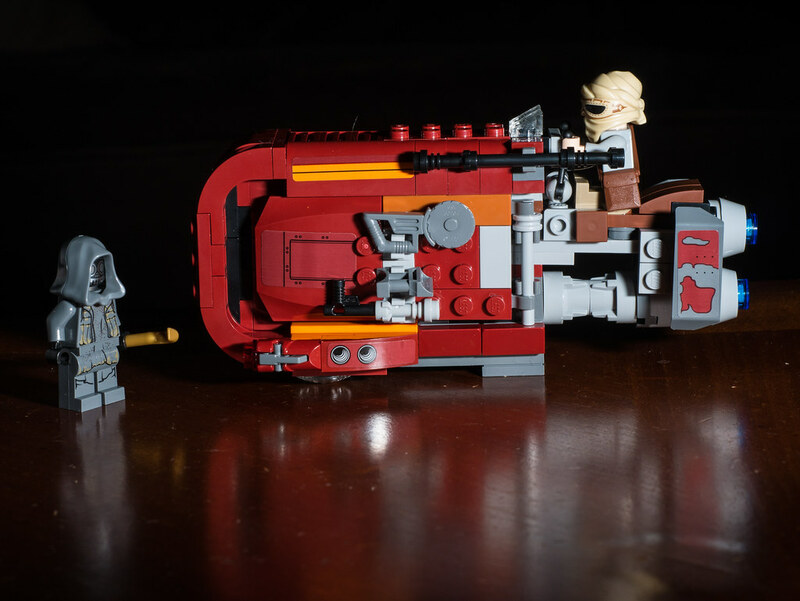 And last, Molly bought Rey’s Speeder (our first Star Wars Lego set) from the Studio Store. (pictures below are from after we returned; the girls built them the morning after we got back home). Then we headed toward the exit, stopped by the photo place to finish out our photo package (yes, you need to do this), and hit the road. 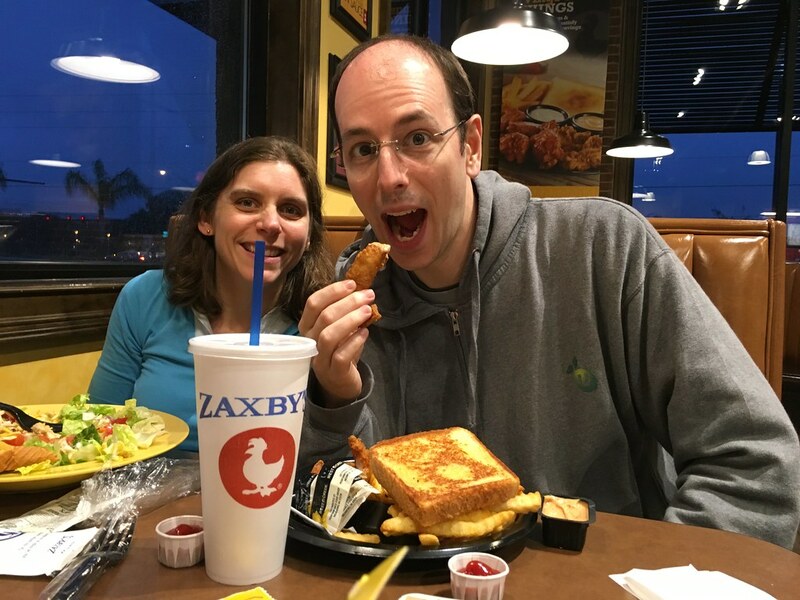 We stopped at Publix to get a bit more cereal for breakfast, then stopped for dinner at Zaxby’s (hooray!) (yes, I love Zaxby’s). Then drove the 45 minutes back to our hotel in Disney World, where I dropped the ladies off. Because it was after hours at that point, I couldn’t return the car to the center. Fortunately, there was an alternative. After stopping off at a gas station in Disney World, I dropped it off at the Dolphin hotel (which is so fancy it handles rentals at the hotel). Then, to get home, I took a bus from the Dolphin to Magic Kingdom, and then a bus from Magic Kingdom to our hotel. Finally, time to rest. It was a good thing as well, since we had to up very early the next morning to make sure we got a spot in the most important event of the trip, but I’ll tell you more about that later. 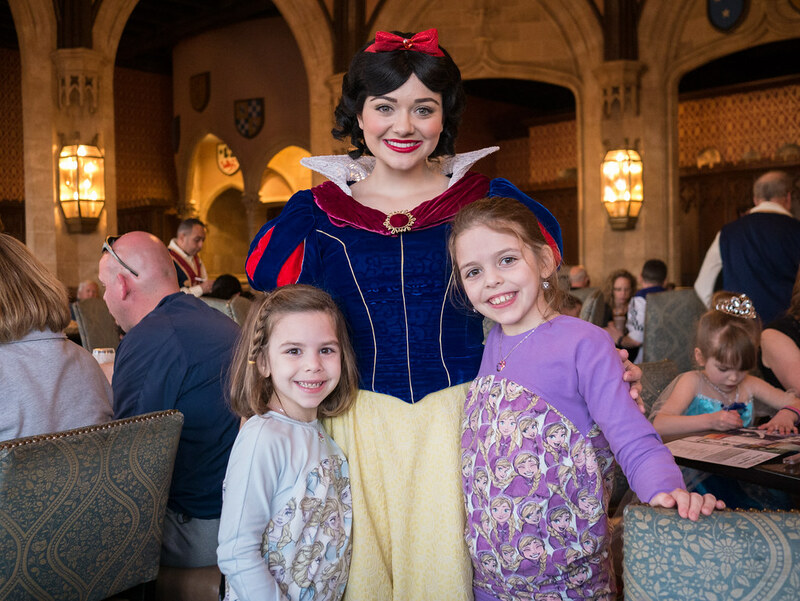 During our Magic Kingdom day, we had our fanciest dinner of all. We had left the park for some rest in the afternoon, but headed back in for dinner and evening activities. Here we are with our dinner destination in the background - Cinderella’s Royal Table high up in Cinderella’s Castle. Before heading up to the dining room, we got to meet our host. 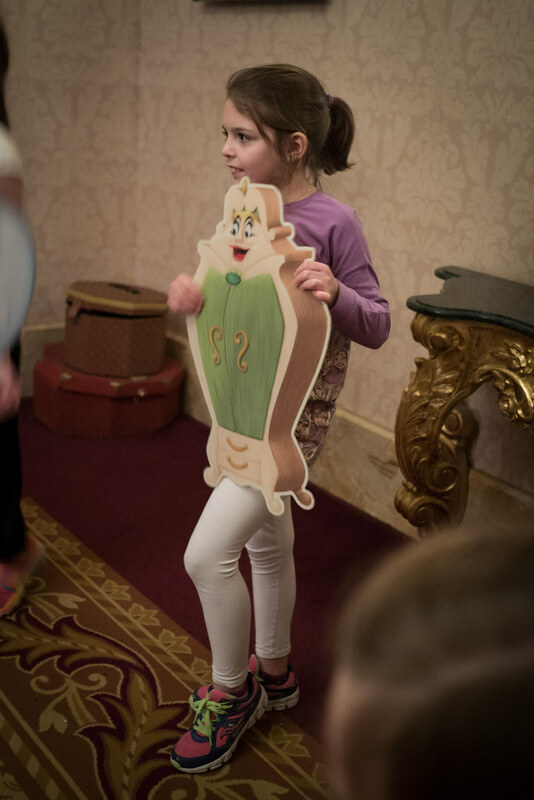 Cinderella always makes sure to greet all her guests as they enter. We then headed up for some excellent service in a fancy (and expensive) restaurant. But we were not the only guests. 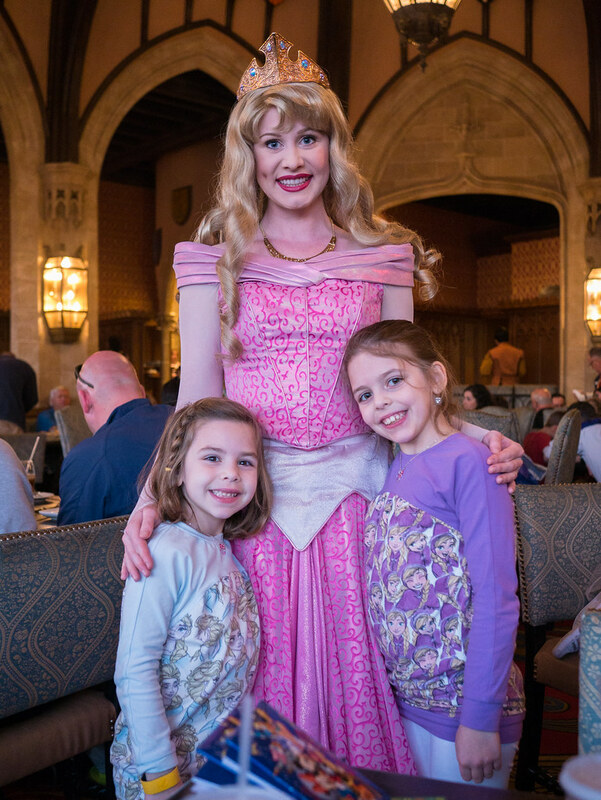 There were a bunch of princesses there to come around and greet everyone. 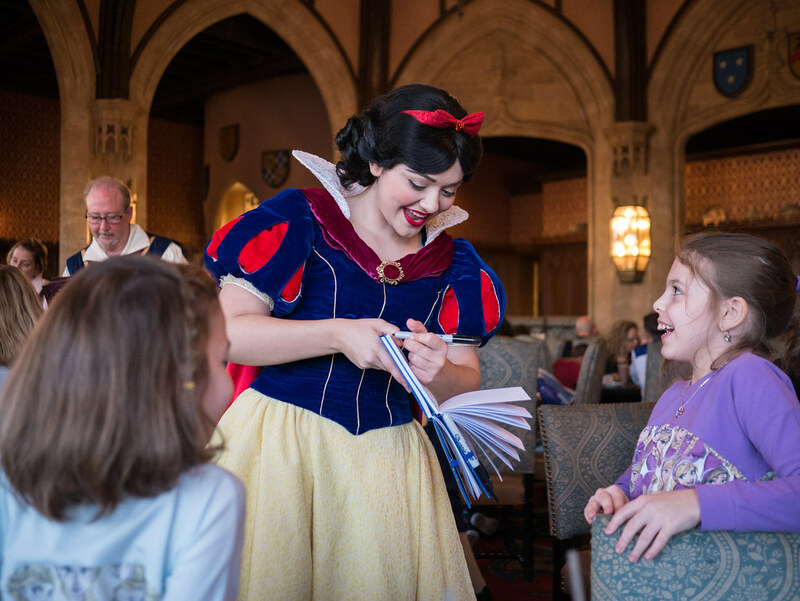 Snow White was the first princess to come around. Trying to temper expectations, I told the girls that it may be a while before she got to our table, as there were a lot of people to greet and we were likely not the first table she’d come to. I was wrong. 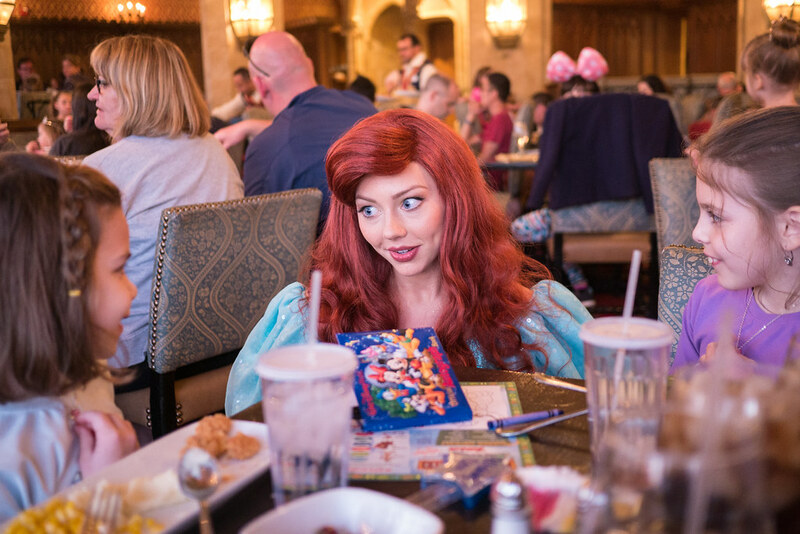 We were the first table she (and all the other princesses) came to say hello. She was happy to give her autograph, have a chat with the girls, and take a photo. After she left, our waitress said she didn’t tell us we were at table number 1 because she didn’t want to ruin the surprise. It definitely was not ruined. Next was Aurora. 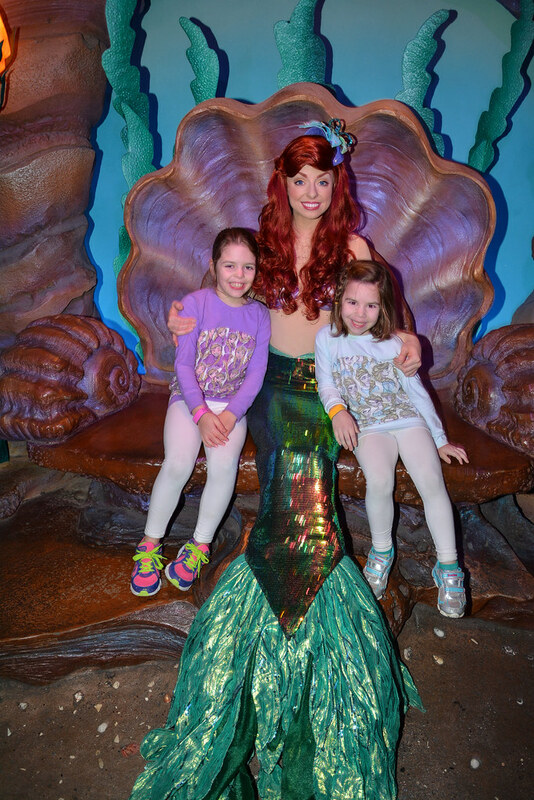 And then Ariel, who was as fun as always. 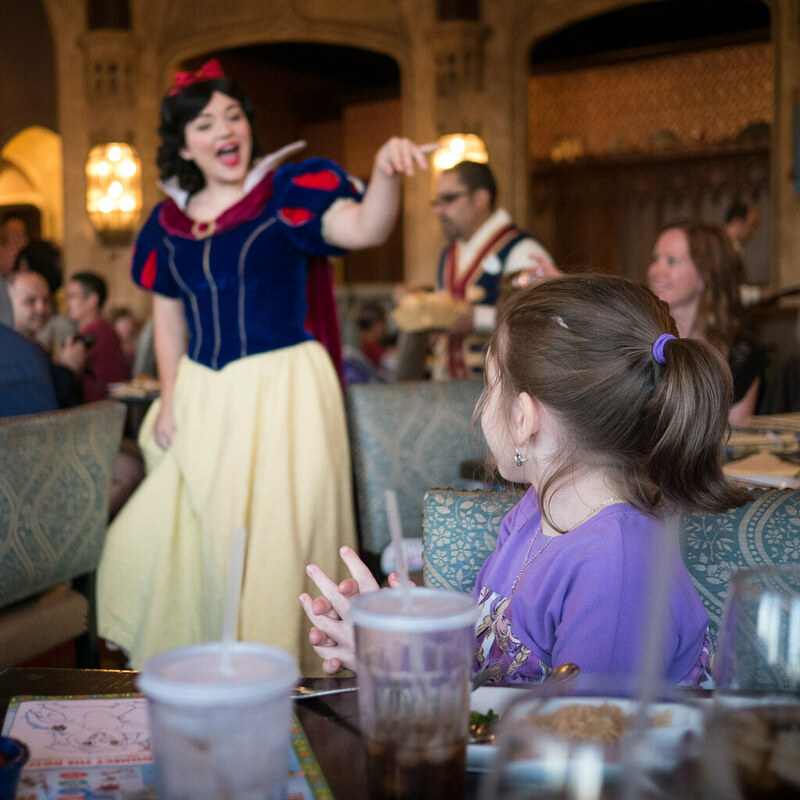 Meeting the characters at their meet-and-greet spots is fun, but having them come to your table while you eat dinner is even better. The meal was good, though not as good as you might like for such an expensive meal. That said, the White Chocolate-Jasmine Tea Mousse that I got for dessert was outstanding, and very unique. I’ve never had anything like it before. On Friday, we headed to Magic Kingdom - the core of Disney World. Again, we showed up in time to take advantage of the Extra Magic Hour. 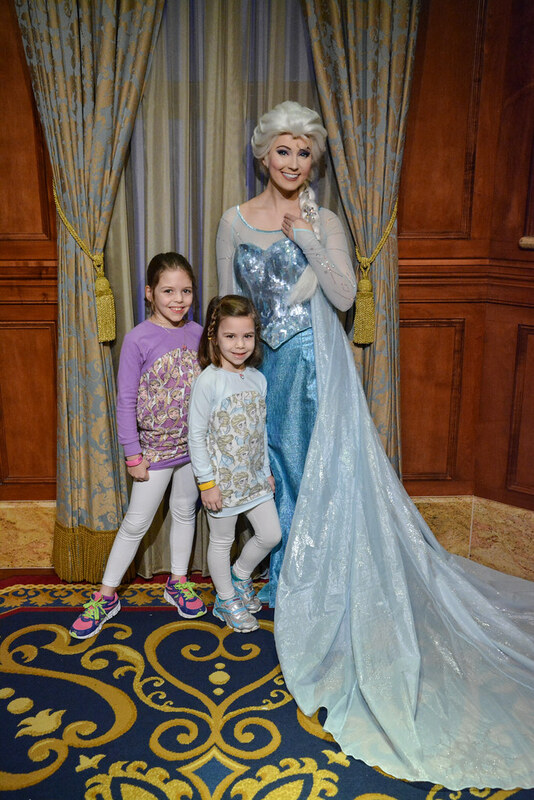 As soon as we got through the gate, we made a beeline to meet Anna and Elsa. 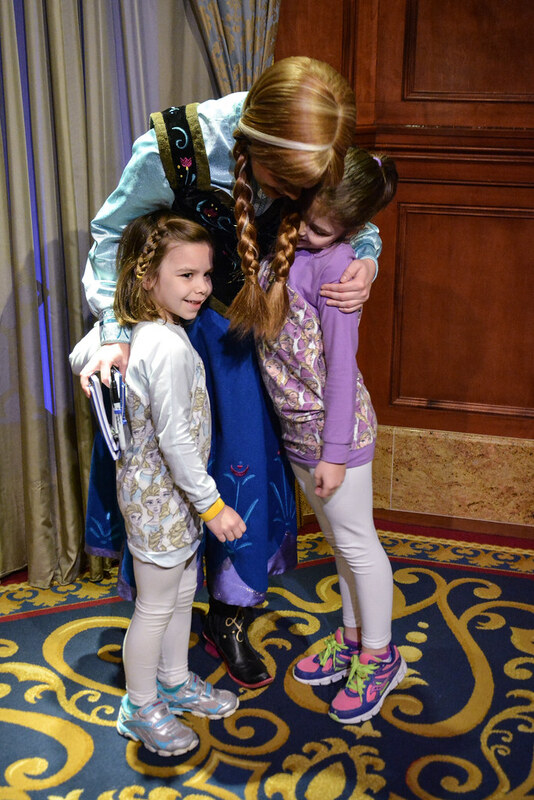 The girls were decked out in the Anna and Elsa tunics Jen had made them, which both Frozen ladies noticed right away. 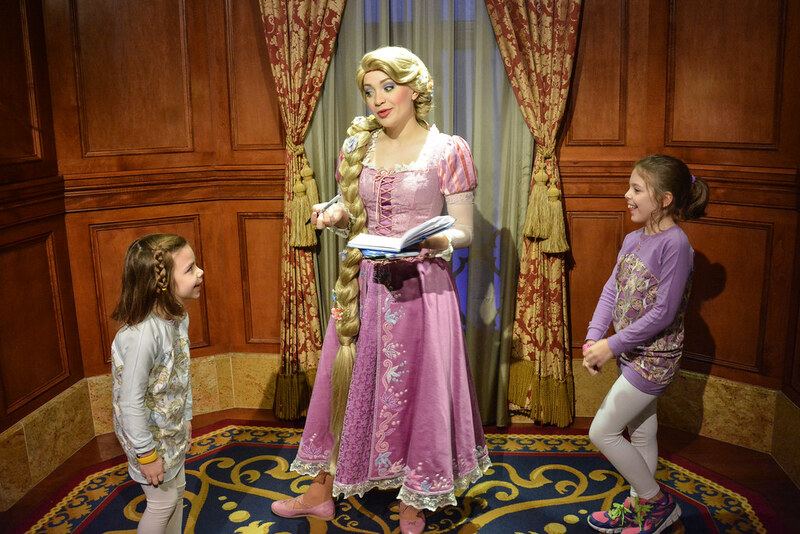 After meeting them, we noticed that the line for Cinderella and Rapunzel wasn't too long. So, we decided to meet them as well. 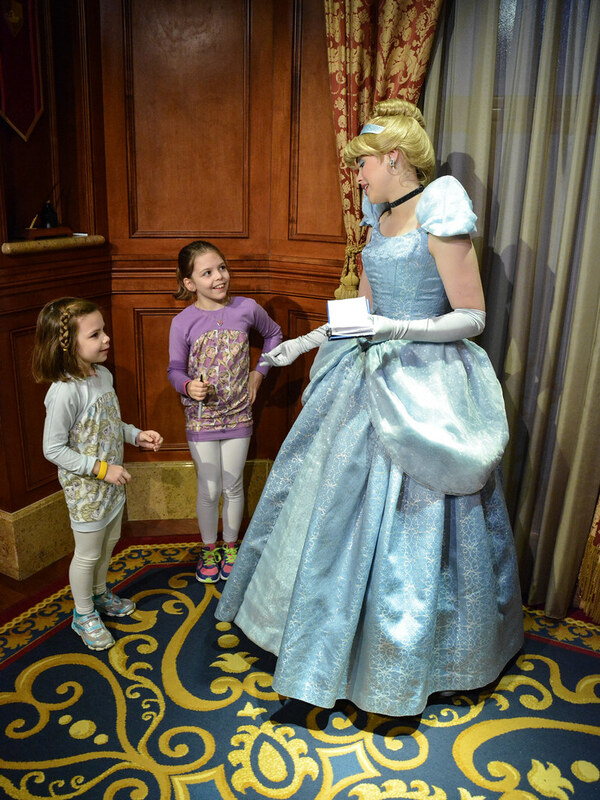 First up was the very kind Cinderella. And then was the very fun Rapunzel. 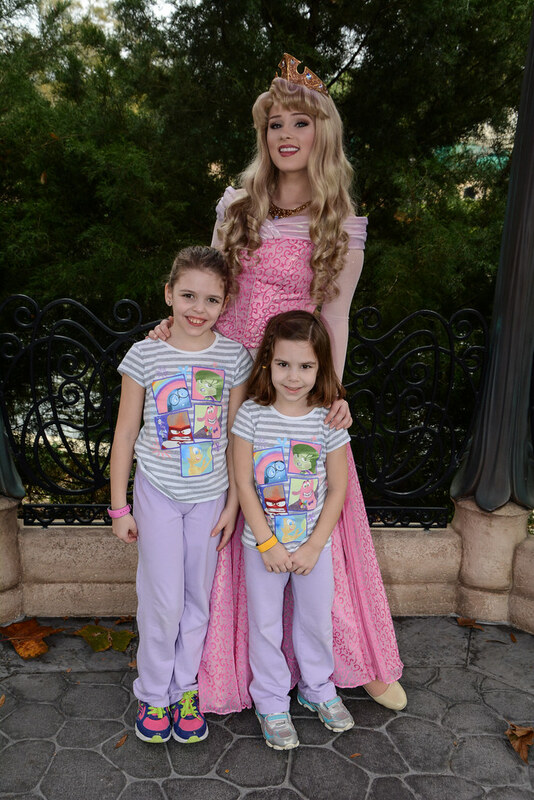 After meeting the princesses, we headed toward Fantasyland, which is where we spent much of our time at the park. 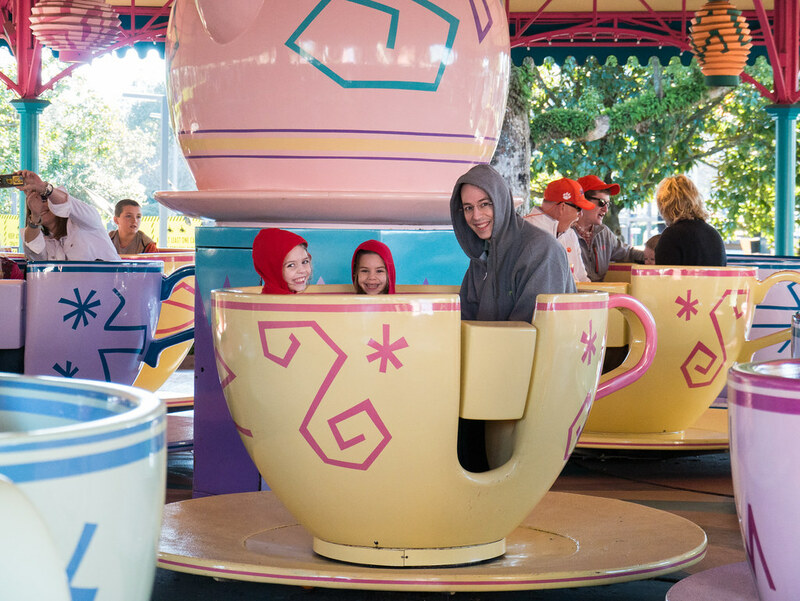 Our first stop was the Mad Tea Party teacups. As usual for something so spinny, Jen was happy to let the other three of us go on it without her. 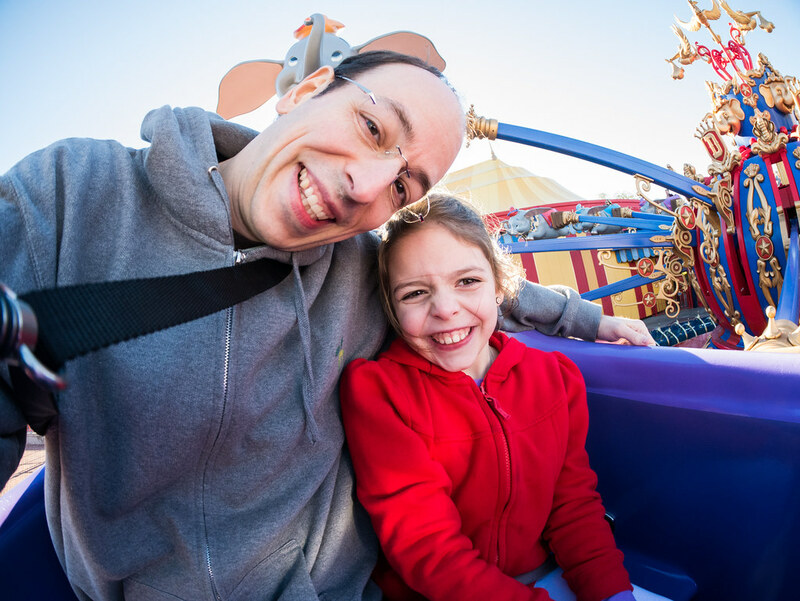 Then we hopped on Dumbo the Flying Elephant for a slower spin. Then we headed over to The Barnstormer. 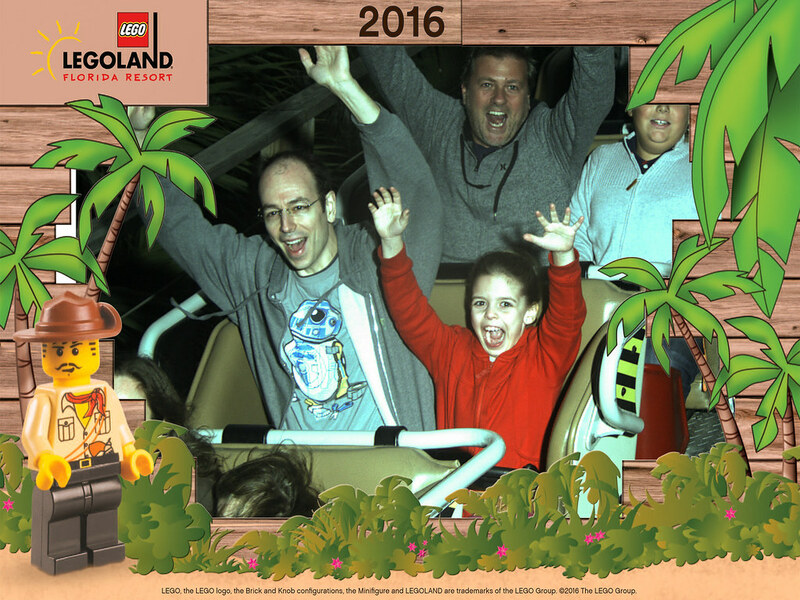 Leah has never been a fan of roller coasters, but we managed to convince her to give it a try. She sat next to me, and Molly sat next to Jen. And this was her face as we rode the ride. She loved it, and got off asking if we could go again. There was no line at all, so we headed in for another turn. Then Molly noticed that she was tall enough to ride by herself. Jen was happy to take a break, so Leah, Molly and I hopped on the coaster. 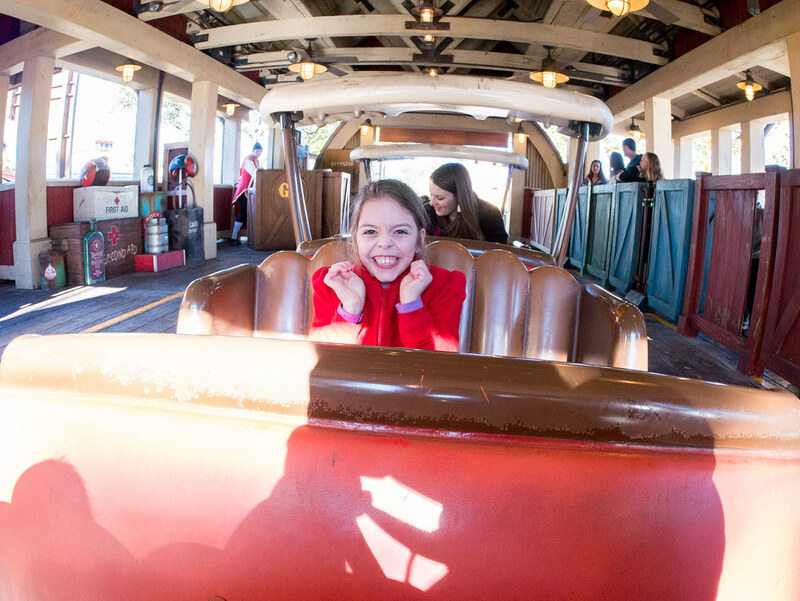 Molly was pretty excited to get to ride a roller coaster by herself for the first time. We then rode it a third time in the same configuration, all three of us still loving it. The girls would have kept going, but we decided that it was time to see a bit more of the park. So, we headed toward Ariel’s place. First, we went into her Grotto (which also had no line) to meet her. Then we headed over to her ride to see the retelling of her story in a new way. Next we headed to the Seven Dwarfs Mine Train (using one of our prebooked FastPasses). After Leah loved The Barnstormer, I figured she’d like this as well. And she definitely did. She hid her face a couple times when it got going fast, but she was still smiling throughout. Leah wanted to ride it a second time too, but it had an hour long wait already. So, we decided to move on. We headed over to Tomorrowland, which was always my favorite part of the park as a kid. First stop - the PeopleMover for a tour of everything. After that, we headed to a fun comedy show at the Monsters, Inc. Laugh Floor. 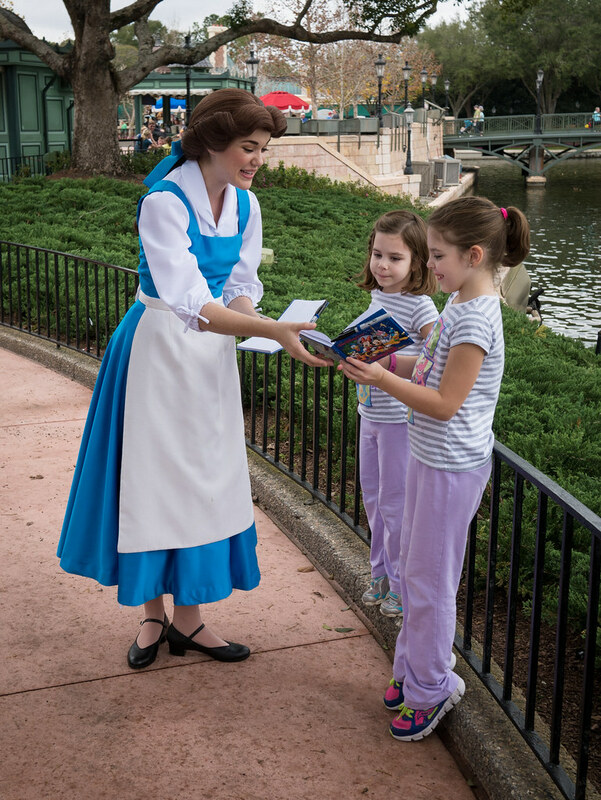 Then we headed back to Fantasyland for Enchanted Tales with Belle (using another FastPass). 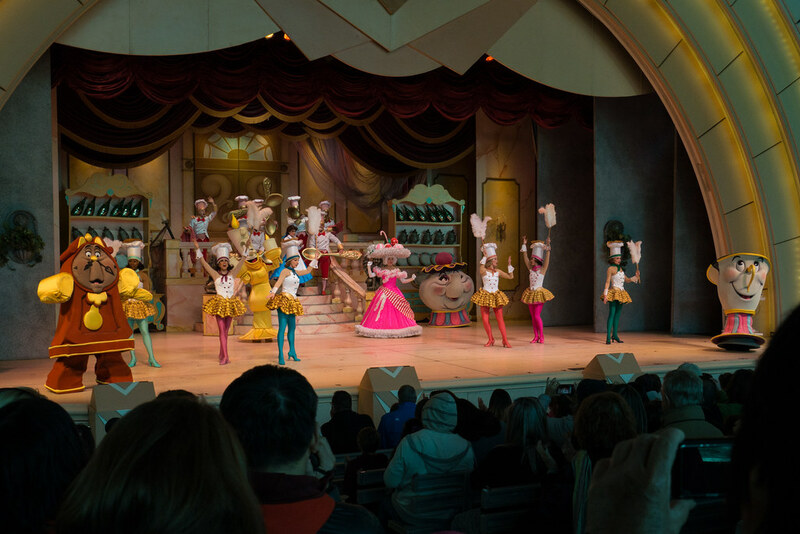 This is one of the most interactive parts of Magic Kingdom, where kids get to play a role in the retelling of the story of Beauty and the Beast. Leah opted to not participate, but Molly played the wardrobe. We then headed over to Peter Pan’s Flight (our last prebooked FastPass) before stopping to eat our PB&J sandwiches for lunch. Then we headed to a ride with an earworm I was hoping to avoid - it’s a small world. Fortunately, the song didn’t stay stuck in our heads for long. At that point, we decided to take a break from rides and shows to shop a bit. We wanted a souvenir Christmas ornament for our tree, and the girls really wanted a toy to bring home. So, we checked out the shops in Liberty Square and on Main Street and made a couple of purchases. At that point, we left the park and headed to our hotel for a nap. We really wanted to partake in the nighttime activities at Magic Kingdom, and we knew we couldn’t make it all day. So, we took a bit of a rest. This ended up working out great, as the girls lasted late with no problems at all. We returned to the park ready for our fanciest dinner of all. But that’s enough of a story to warrant its own post, so you’ll have to wait till tomorrow to hear about it. After dinner, we had some time before the fun evening activities. So, Jen suggested we go to the Haunted Mansion. I wasn’t so sure, but went along with it. As you may have already guessed, the girls were not fans. I rode with Molly, and she totally freaked out. 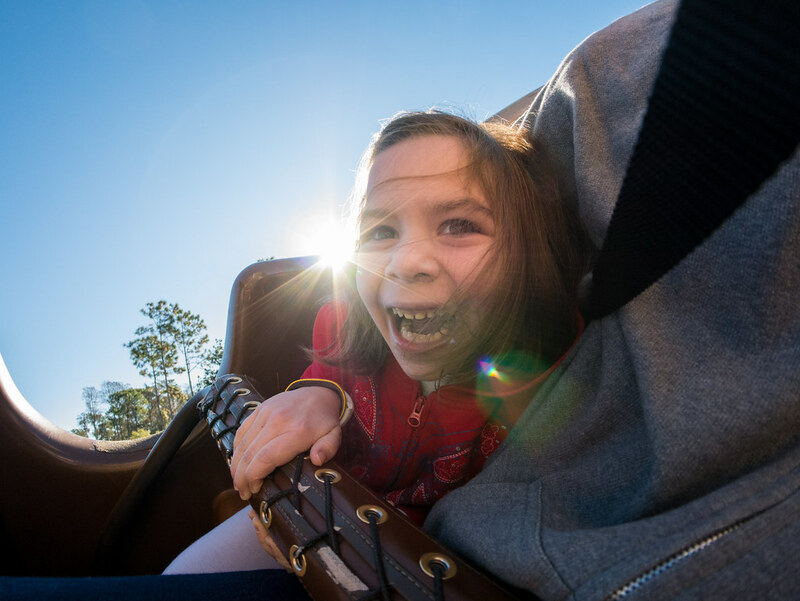 She ended up closing her eyes and covering her ears for almost the entire ride. Jen said Leah did mostly OK with her, though afterward Leah said she did not like it at all. 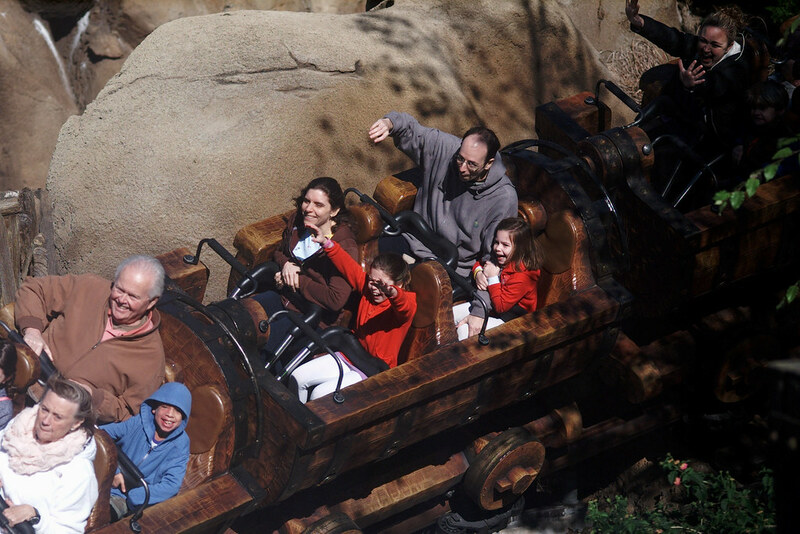 Then, we headed to my favorite ride as a kid - Big Thunder Mountain Railroad. The line was really long, but I had thankfully scheduled a FastPass for it earlier in the day (after we’d used our rebooked 3). So, we walked right in. I was worried Leah wouldn’t do as well on it since it’s more serious than the earlier coasters, but she loved it (as did Molly). We got off and the girls were asking to go again. Sadly, the FastPass only got us the one ride, so there was no return trip in our plan. We then went to Mickey’s PhilharMagic - a 3D movie that was both enjoyable and indoors, giving us time to warm up a bit. Then it was on to find a place to watch the Electrical Parade, which started at 9:00. We followed the advice of touringplans.com and set up just outside the Sleepy Hollow restaurant. 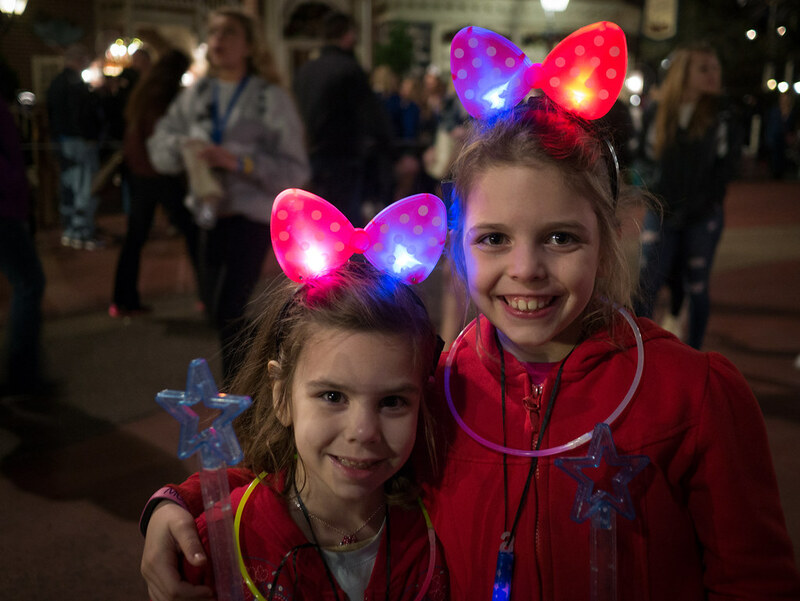 The girls were ready to go with glowing accouterments that Jen had purchased months in advance for deals much cheaper than could ever be found in the park. And the parade was lots of fun. The girls probably could have watched it for much longer, despite being cold and up late. After the parade, we moved toward Main Street to find a spot to watch the fireworks at 10:00. 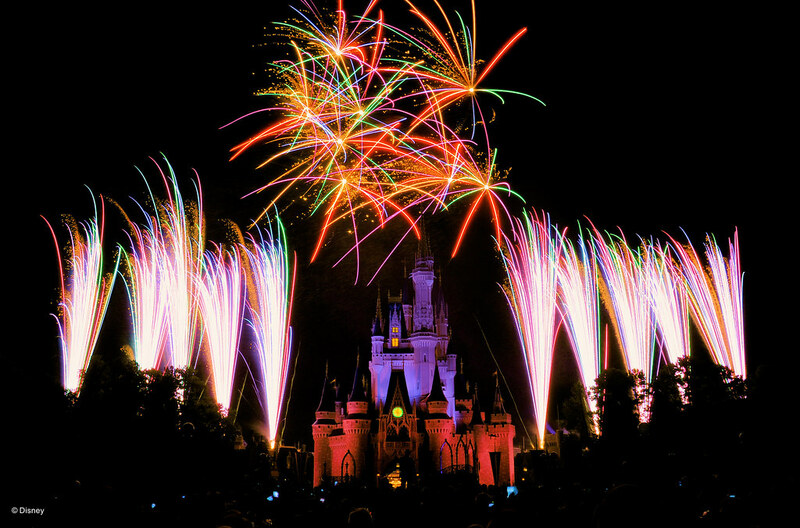 We didn’t realize that there was going to be another show before the fireworks - Celebrate the Magic. Fortunately, we managed to catch this show as well as the outstanding Wishes Nighttime Spectacular fireworks show. We had an awesome day at Magic Kingdom. We could have easily spent another day there, as there was just so much to do. 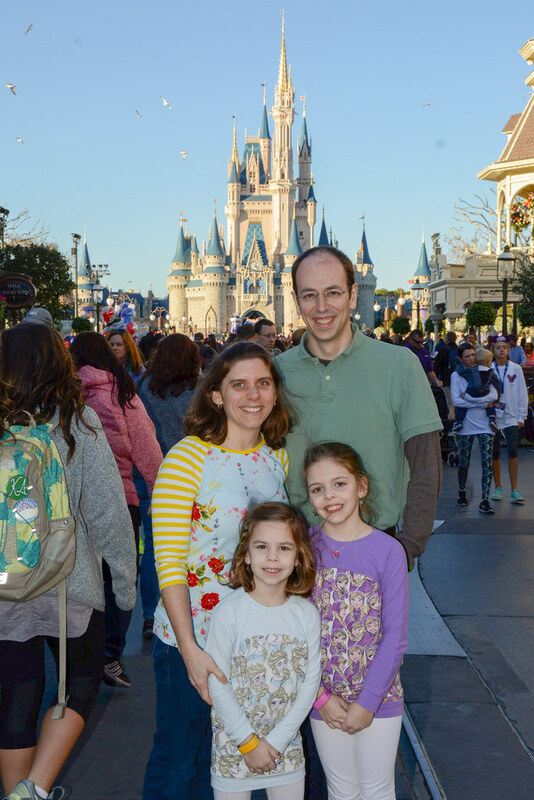 Magic Kingdom was generally ranked as either the #1 or #2 park we visited by the members of our family, but it definitely had the most to offer of them all. The break in the middle of the day worked out perfectly, meaning we could be there early in the morning and late into the night without any grumpiness from the girls. And fortunately, our next morning was not quite as early, but more on that later. After flying in late Wednesday night, we were up early Thursday morning to be at Epcot for the Extra Magic Hour starting at 8:00am. Before heading to any ride, we stopped to take a picture. 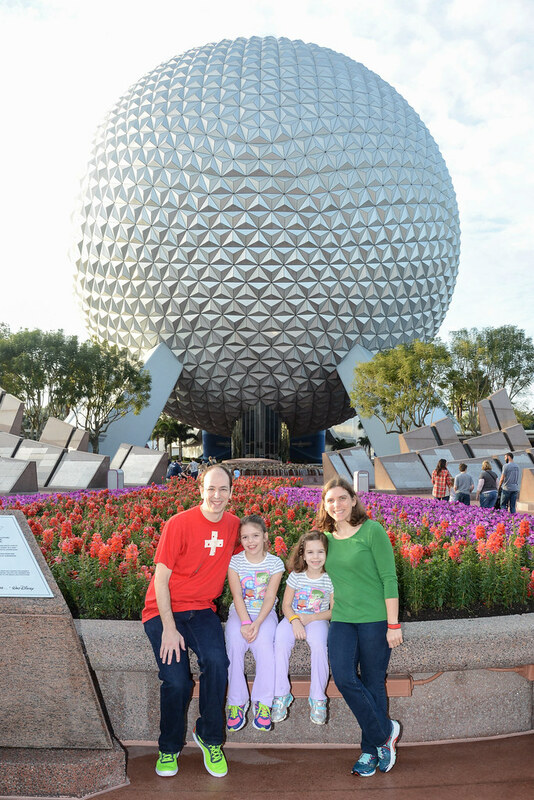 What could say Epcot better than a picture in front of the giant sphere that is Spaceship Earth? Um, Leah, I think there’s something on your hand there. 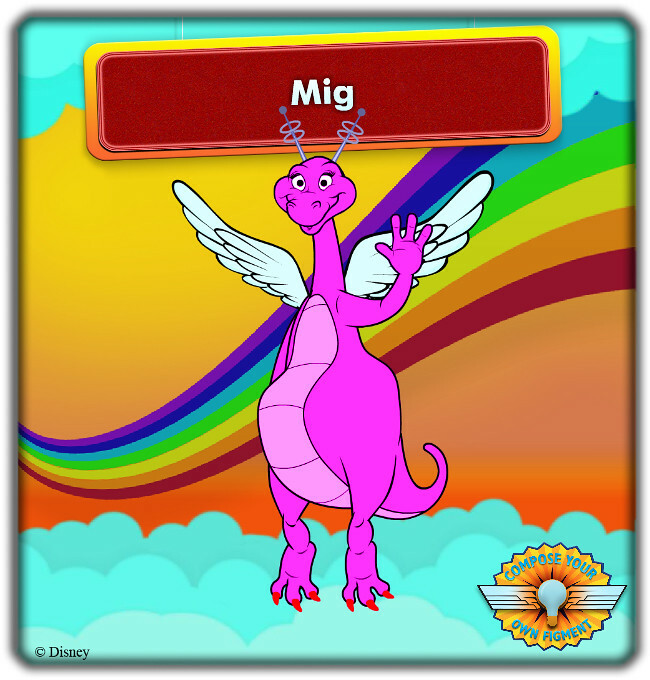 Thanks Disney Magic! First, we headed to take a ride in Spaceship Earth. 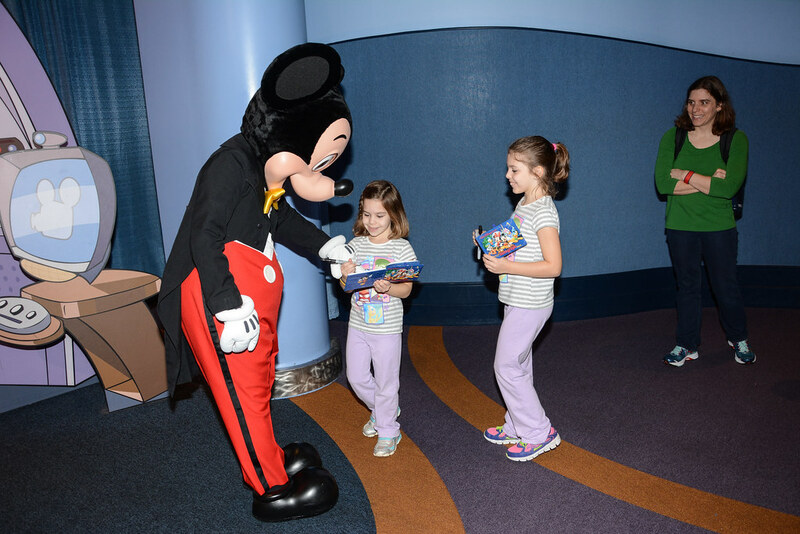 Then, we headed over to our first character meet-and-greet - Mickey Mouse. 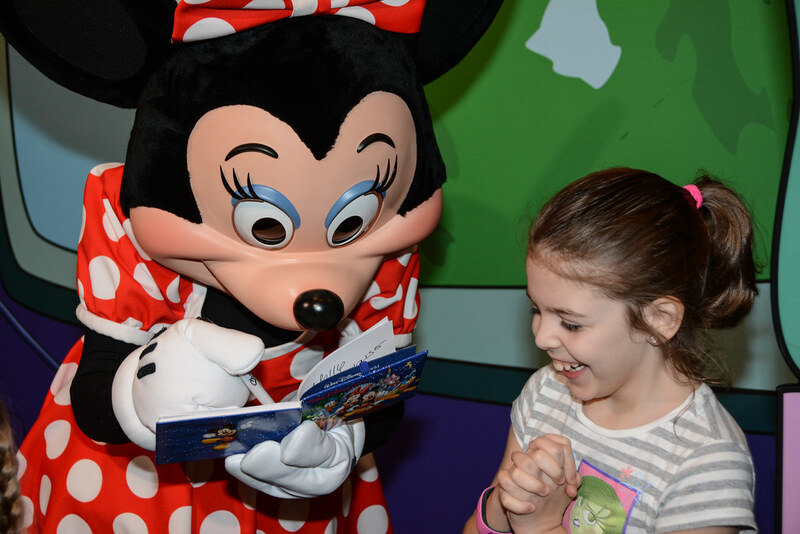 The girls had their autograph books ready. Next to Mickey was Goofy. 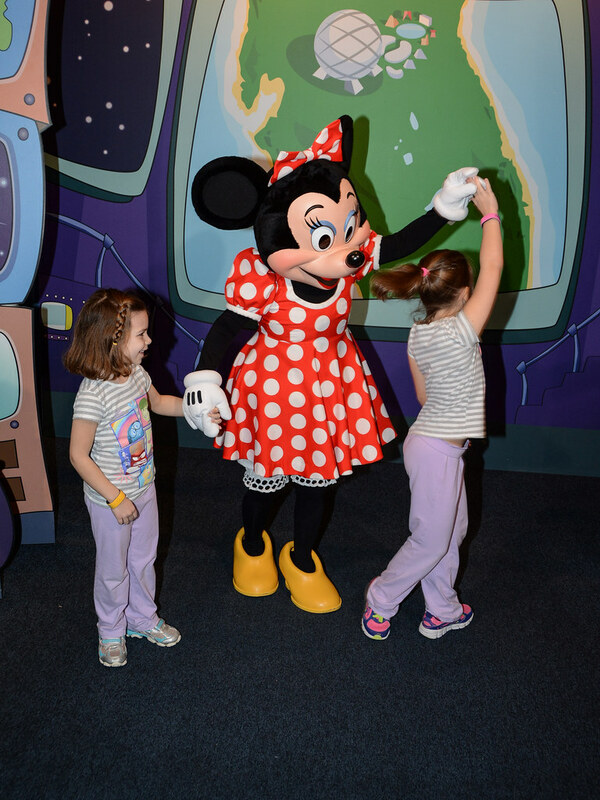 And next to Goofy was Minnie Mouse - one of the characters the girls were really looking forward to. They even got to do some dancing with her. 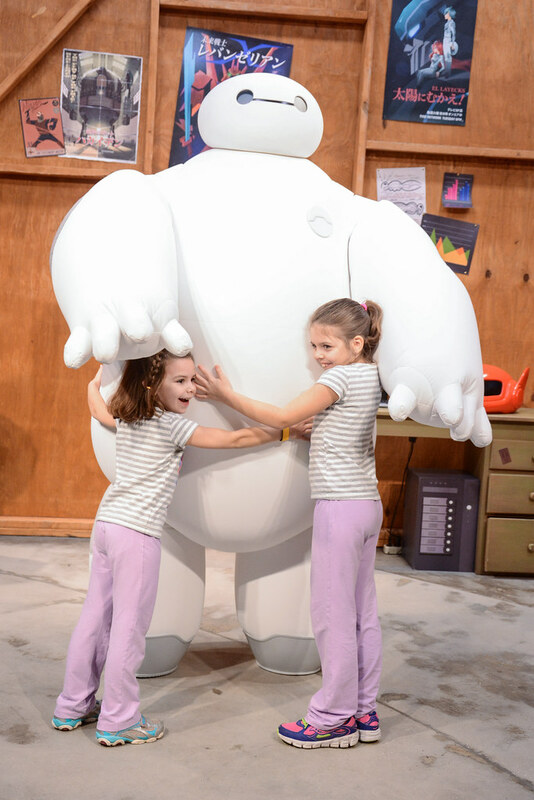 Next, we decided to meet a much newer character - Baymax. The girls even got to give him a fist bump. 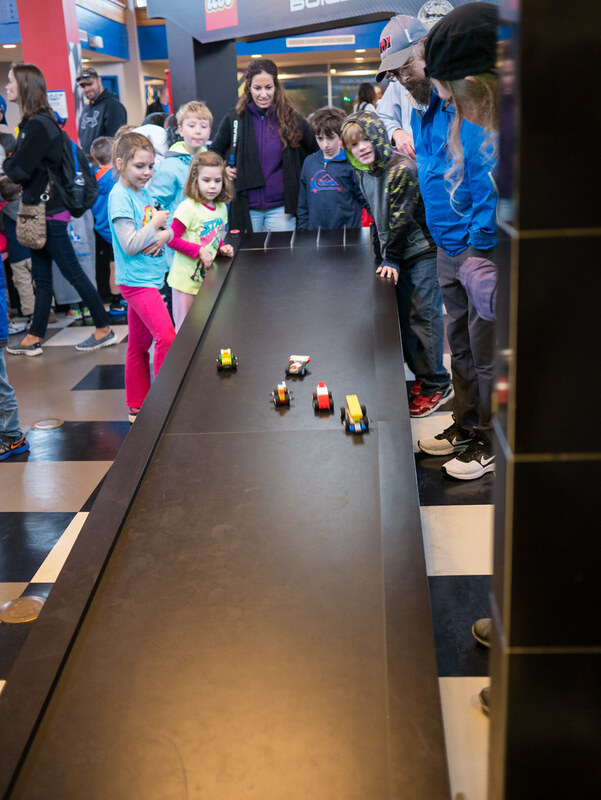 We then headed to Test Track - an awesome ride where you get to design your car (using a large touchscreen computer), then get to ride in a simulation car and see how your design performs. Here we are in the simulation car. 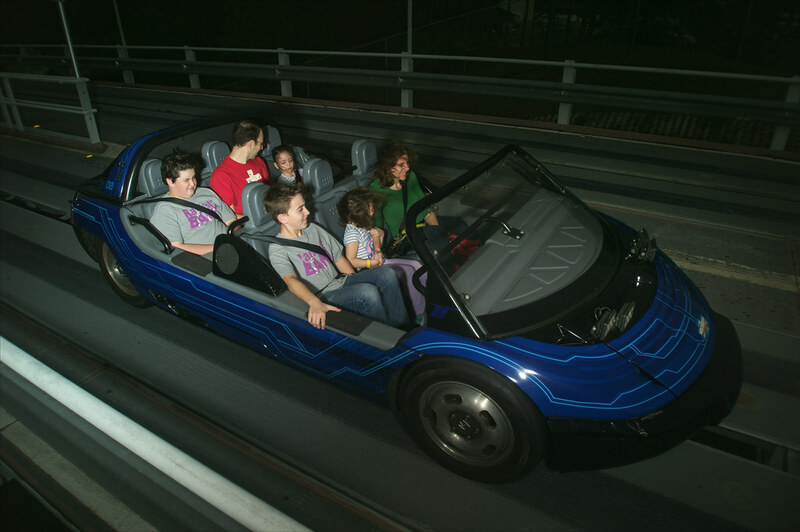 After Test Track, we hit a bunch of the fun attractions at the front of the park before the World Showcase opened. We went to The Seas with Nemo & Friends and other aquatic fun there like SeaBase and Turtle Talk with Crush. We ate our PB&J sandwiches. 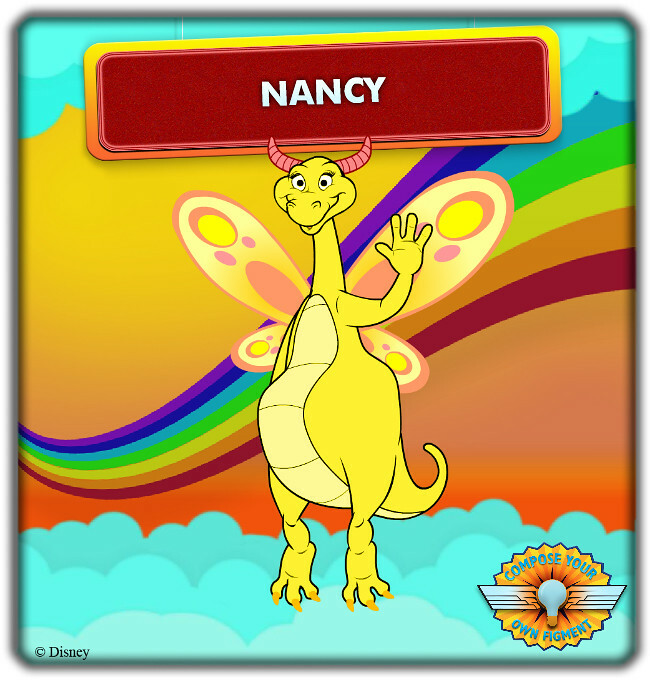 We journeyed into our imagination with Figment, after which the girls of course made their own figments (Nancy is Leah’s, Mig is Molly’s). Then it was off to the World Showcase. We started off by meeting some more characters. We first headed to the United Kingdom and found Mary Poppins. She said our girls’ grey shirts reminded her of a chimney sweep, so she decided to teach them the Step In Time. We then walked down to France to be the last people in line to meet Belle. Also in France, we found Aurora. After meeting so many characters, we decided to take on an adventure. The Phineas and Ferb: Agent P's World Showcase Adventure is an interactive mission, in which we were given a smartphone to guide us through a secret agent mission in France. It led us to different places around France, and activated hidden features. The mission was fun, but enough at 30 minutes. At the end of the mission, we were asked if we wanted to another mission in the next country, and the girls chose not to. Instead, we decided France was an excellent place to get a sweet treat. That was an excellent choice. Jen and Leah went to the ice cream place, while Molly and I went to the patisserie for some tarts. Yum. 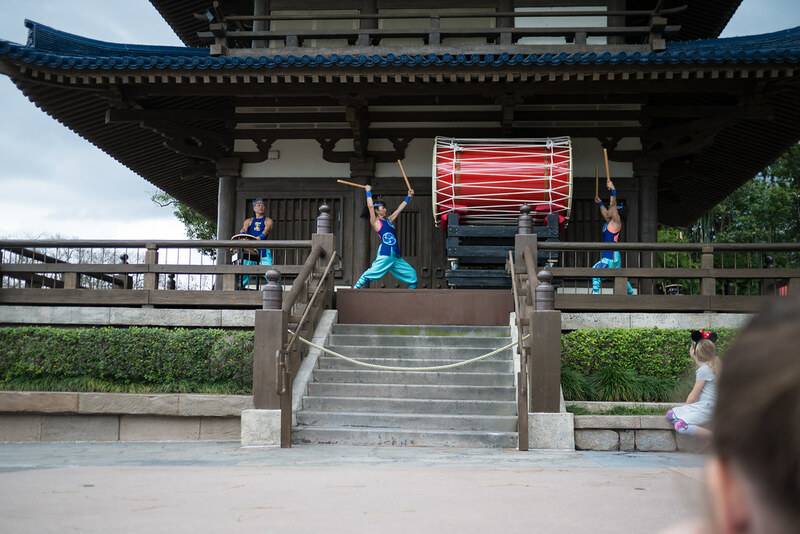 After our treats, we headed down to Japan to listen to some Japanese drumming. They had a really big drum. We then wandered down to the U.S.A. to listen to the a cappella music of the American Music Machine - lots of fun. Then we walked to Italy and saw an entertaining juggler. The girls also tried out one of the Kidcot Fun Stops, though we just did the one. Then on to China to see some acrobats. We then walked back to Italy for dinner. We figured we’d be eating pizza on this trip, so we thought we’d go for a high quality one. 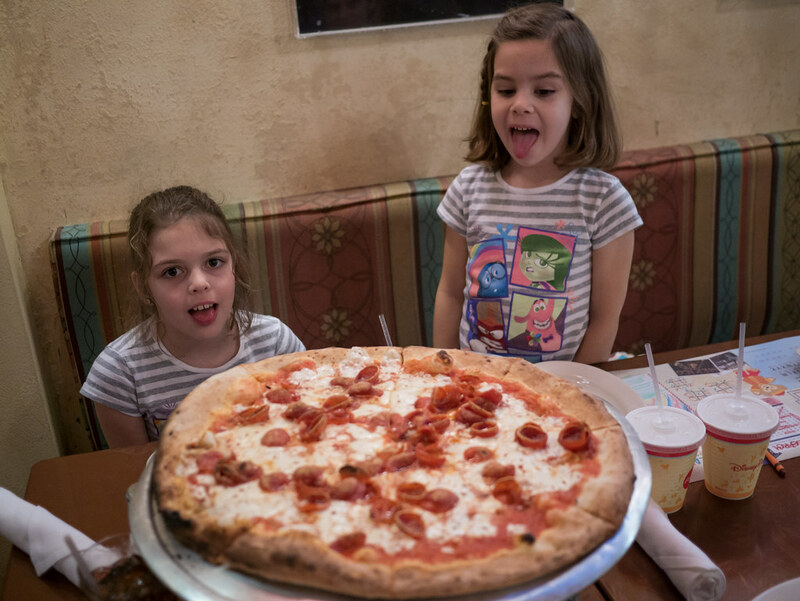 We had reservations at Via Napoli Ristorante e Pizzeria. The girls were hungry for it. It was good, though not great, pizza. Sadly, Leah was not a fan of the pizza. Combined with being tired, she turned into a bit of a grump. So, we decided it was time to head back to the hotel rather than sticking around for the fireworks. 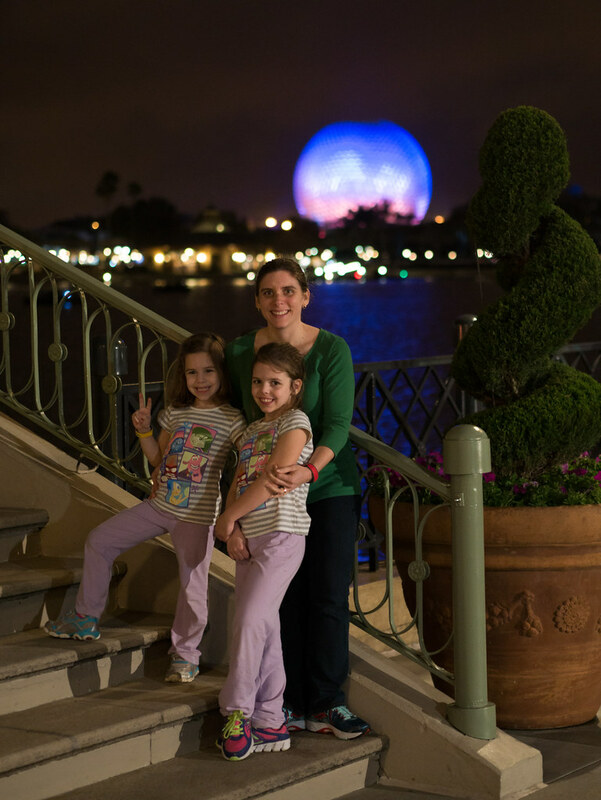 After heading out of the restaurant, I took a quick picture of the ladies with the far off Spaceship Earth in the background. 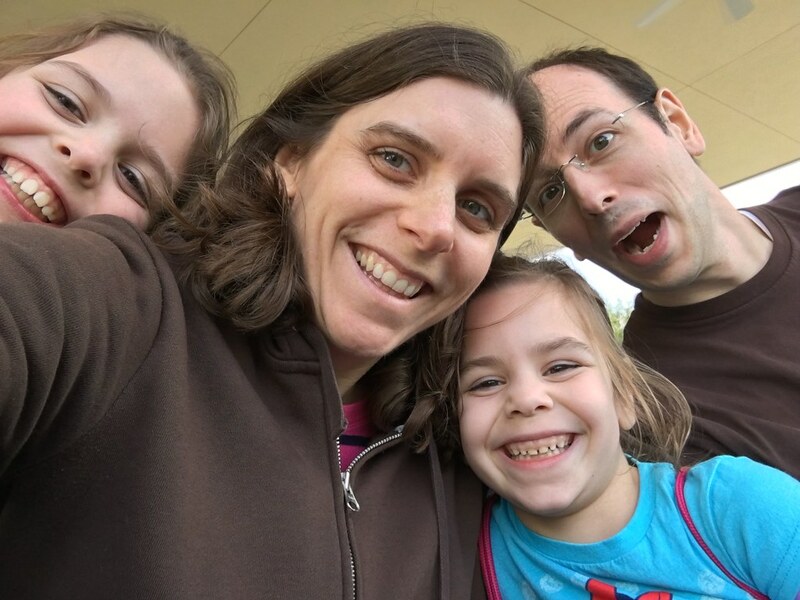 After the long walk back (Leah rode on my shoulders), we even got a magical shot of the four of us. When we finally got back to our room, Leah was very happy to see her bed. 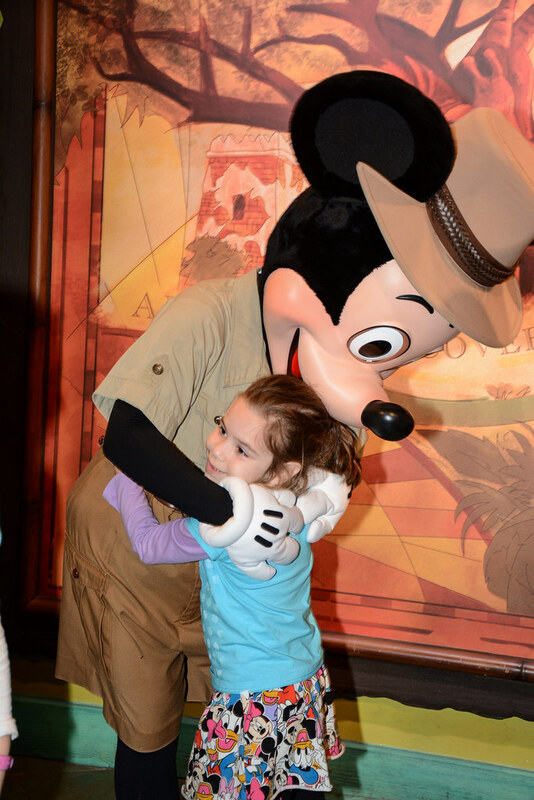 Which was a good thing, since we were getting up early the next morning to head to the Magic Kingdom. Overall, Epcot was lots of fun and served as a good warmup day for the trip, with smaller crowds and fewer things planned. 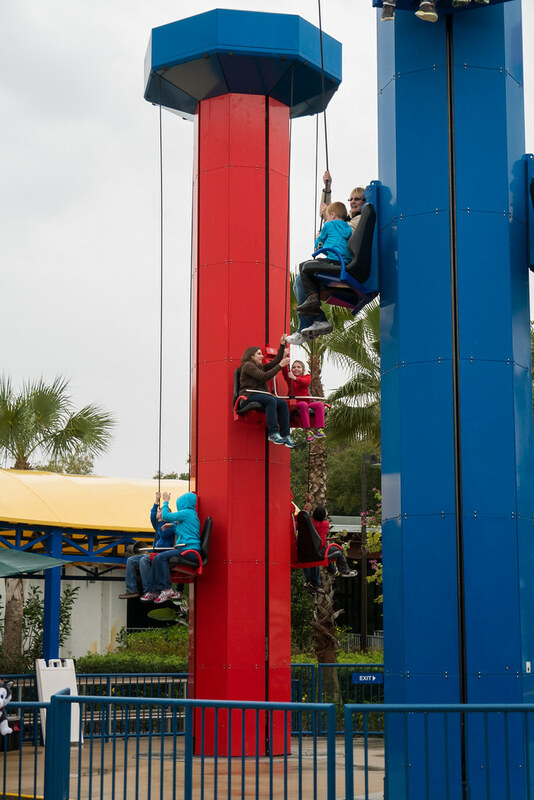 I don’t think any of us would say it was our favorite park, but it was still awesome. A week ago, we were in Orlando. 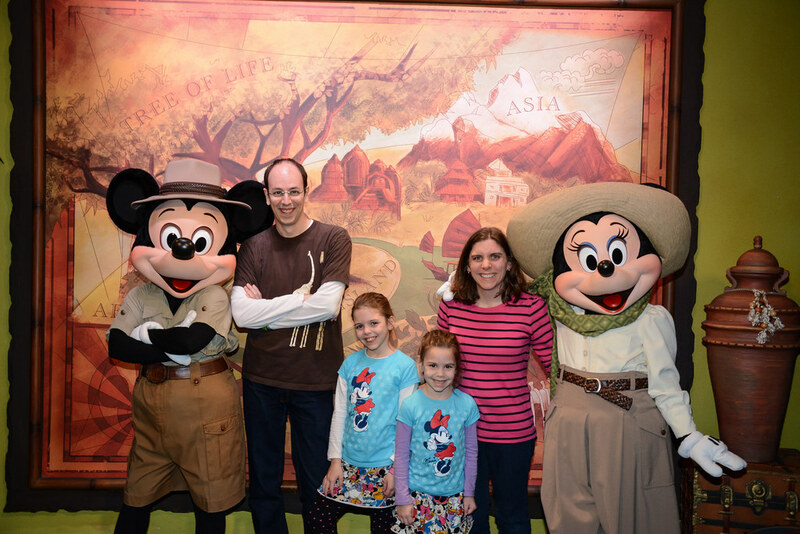 We took our first trip down to Disney World, and it was awesome. Over the next several days, I’ll walk you through the awesomeness of the trip, but I figured I’d start with some overall impressions and logistics. First, Disney World is awesome. The kids and adults all had a great time. It’s a level above other theme parks. 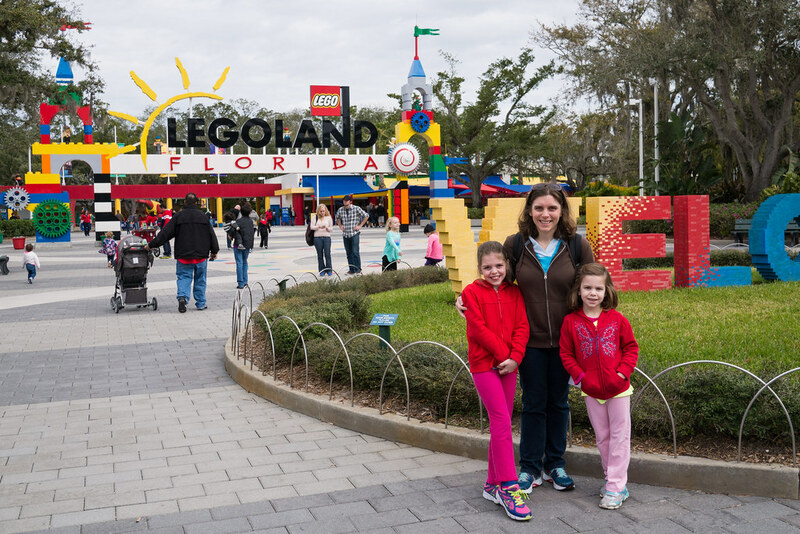 We also took one day to go to Legoland, which was fun, but not on the same level as Disney World. Our goal for our room was to be able to get to and from the parks as easily as possible. So, we stayed on Disney World property at the Pop Century Resort and requested a room close to the front desk in order to be close to the bus stop. This meant we had very little walking to do on the resort, which worked out very well. 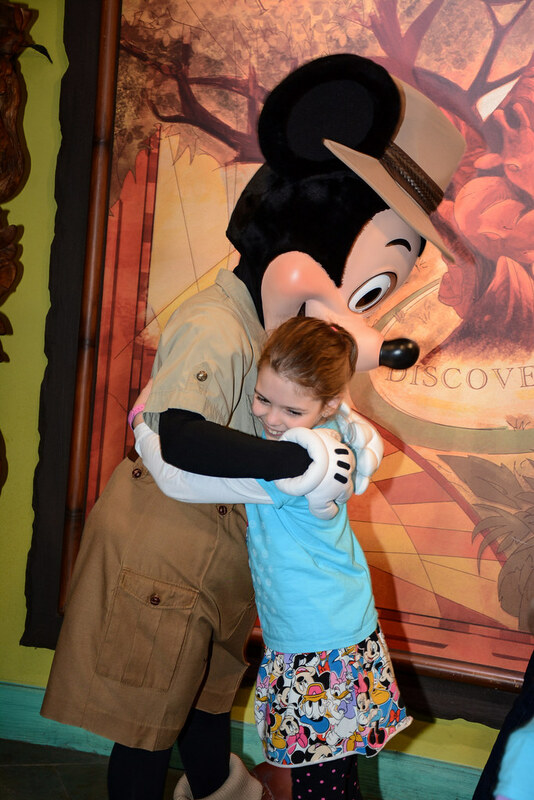 Mardi Gras escapers - growing up in Louisiana, we know that while most folks partake in the Mardi Gras celebrations, a large contingent takes advantage of the time off to go to Disney World. Cheerleaders - The UCA National High School Cheerleading Championship was being held at Disney World while we were there, so there were lots of cheerleaders everywhere. There were 1,250 girls from Argentina celebrating their 15th birthday (quinceañera). There may have been other quinceañera groups there as well, I’m really not sure. But wow, were they loud and annoying. They stayed at Pop Century so we got to share the bus with them, but thankfully they were not in the same building at the resort as us. 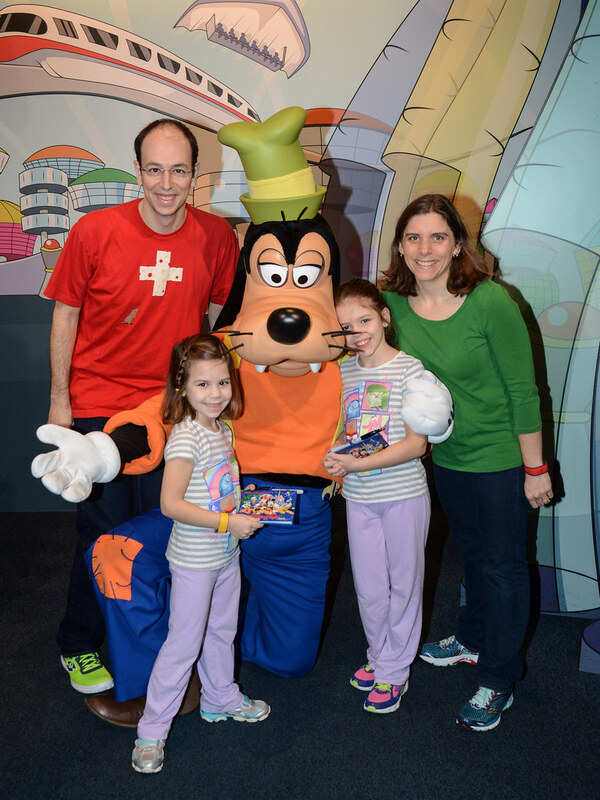 I’m a big fan of the Memory Maker package for PhotoPass pictures. More than half the pictures you’ll see here were taken by Disney photographers instead of me. Extra Magic Hours are awesome as well (at least the morning ones, as that’s all we used). We planned which park we’d go to based on when they had them, and used them every morning at Disney World. Getting into the park early meant no lines for some things, and getting certain access to things we might never have gotten. We really don’t like waking up early, but it was worth it. For food, we opted to go big or go small. This meant we used our own groceries for most of our food (delivered to the room by Garden Grocer - very cool). We ate breakfast in the room, and Jen packed sandwiches for lunch and more snacks than we could ever eat into little baggies. Then for dinner we threw in some more exciting options (more on that later). Also, this meant we did not do a Disney dining plan. We’d definitely do it this way again. We booked our trip through a AAA travel agent we found through a friend, who was very helpful. We’d definitely do that again as well. And now onto the fun. I finally arrived home Monday night. 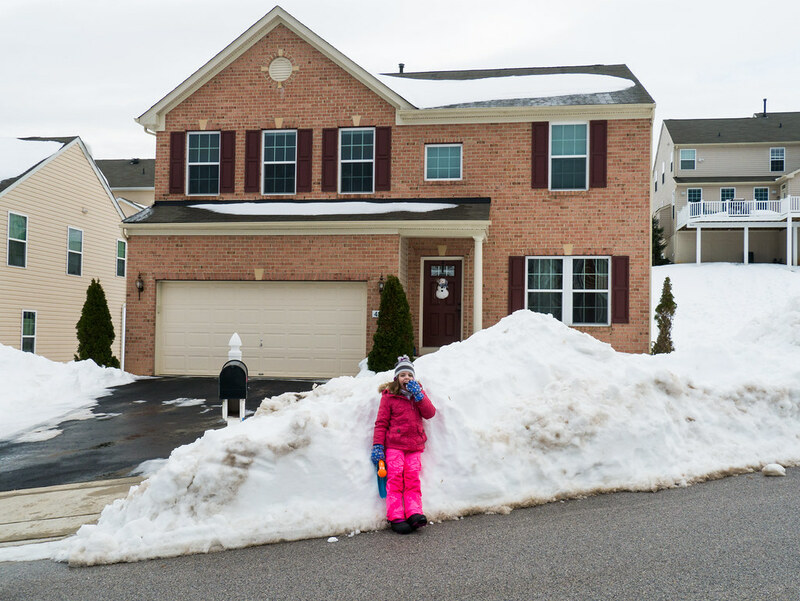 We tried to swing by Aunt EA’s house in Silver Spring on the way, but found her neighborhood had not been plowed yet. Fortunately we knew we could get to my house and Grams’s house. We came to my house first to drop me off, then Aunt EA and Grams went on to Grams’s house. Thanks to Jen for shoveling all the snow piled up at the end of the driveway by the plow earlier in the day. While I missed much of the snow, I did manage to get out in it briefly with my girls. A fair amount of it had already melted, but the giant piles covering the sidewalk are still taller than Molly. The snow was still quite deep, so we sunk down into it when walking around. The snow was also level, despite the ground below not being level. So, occasionally you take a step and find the snow is so deep that your leg has disappeared below you. 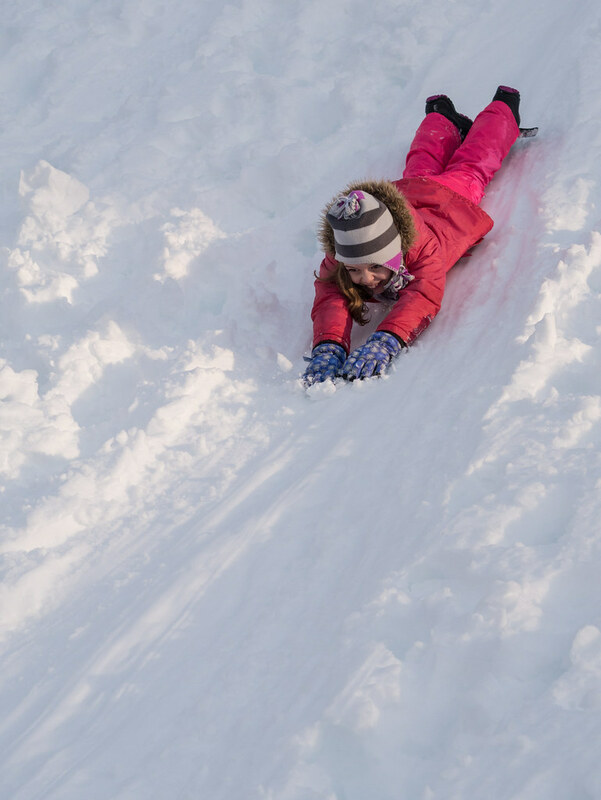 The girls and I had a lot of fun sledding in our back yard. Here they are showing how much fun it is. 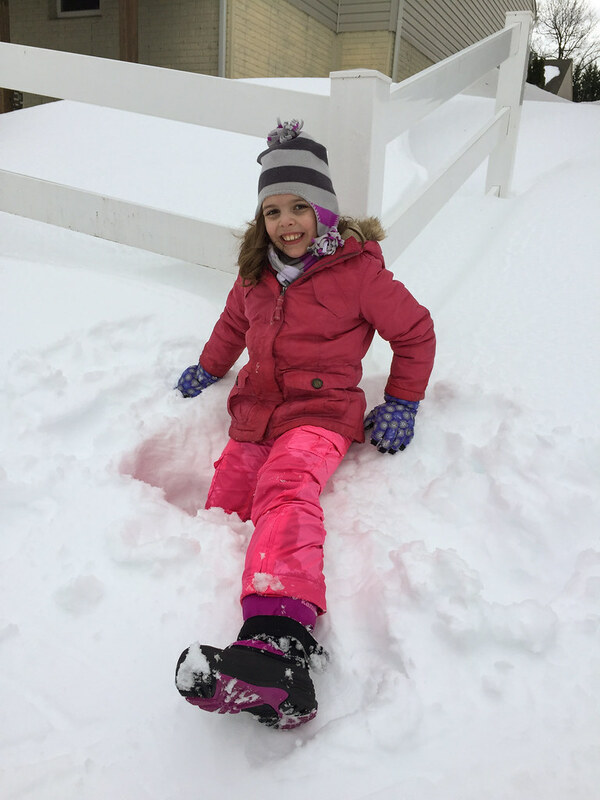 Here Leah shows off that you don’t need a sled to sled - your bottom will do just fine. 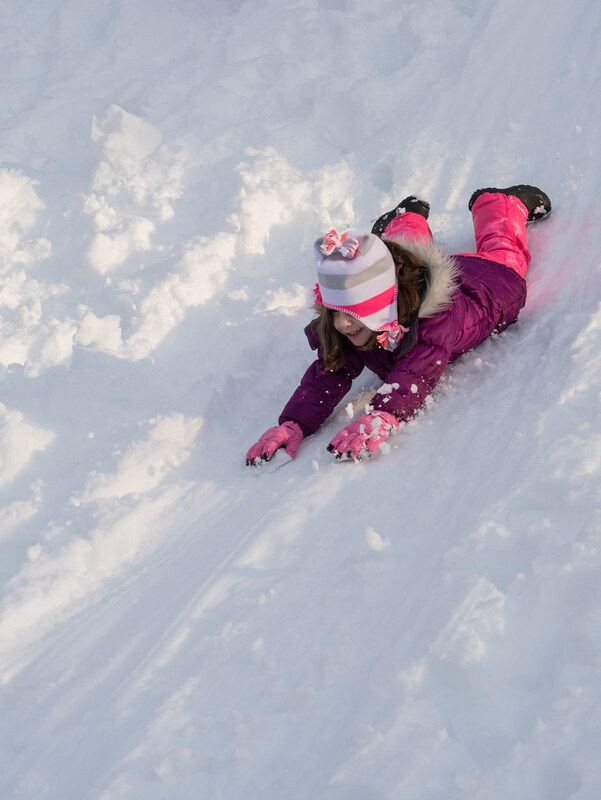 This is especially true if you use a track that someone heavy (say Daddy) has already carved out of the snow by sledding down. The girls call this penguin sliding, which I guess is a good description. They got going pretty fast like this, though ended up soaking wet from the snow. 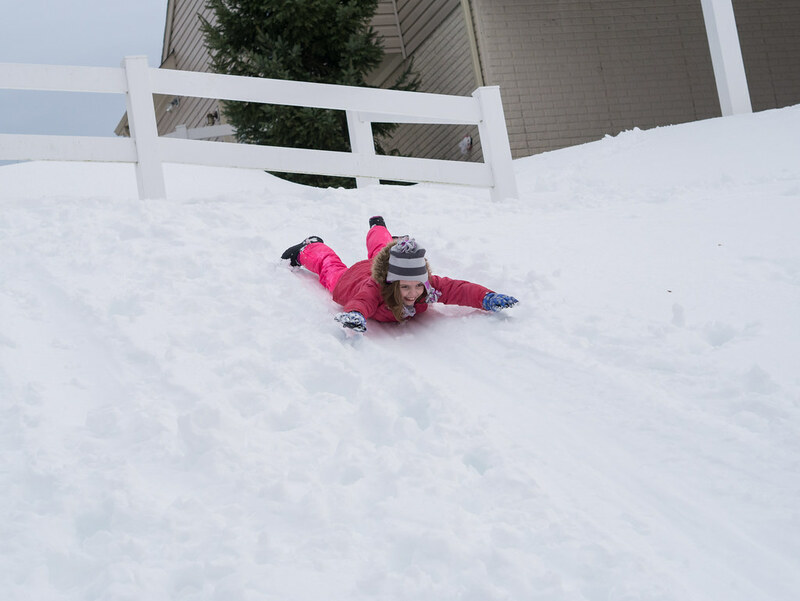 Or you can lift up your arms and legs for a belly slide. 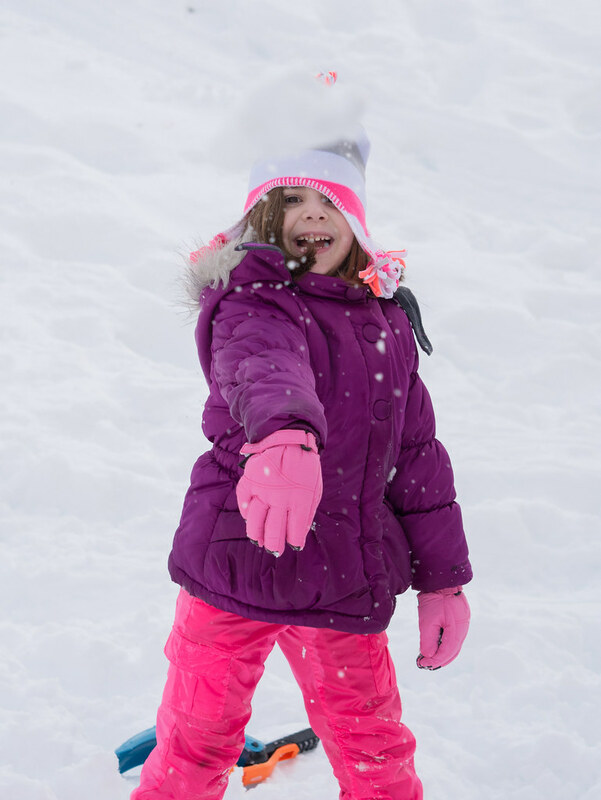 There were a lot of snowballs thrown, including the blurry one obscuring Leah’s hat in this shot. This is what I was missing when I was stuck away, so I was glad I got to have some fun in the snow with them after getting back.